Difficulty Notes: With careful routefinding this is no more than easy to moderate scrambling at most. 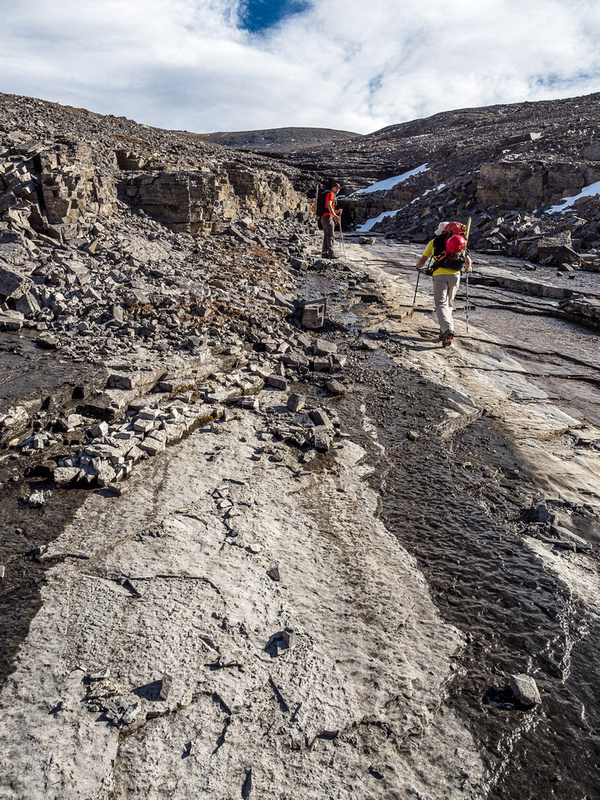 But it’s a long and remote trip that shouldn’t be underestimated. There are 9 river crossings to knee deep from marker 39 and that assumes your vehicle can drive that far. With the upcoming Thanksgiving long weekend and some unexpected days off work the Thursday and Friday beforehand, I was looking to take advantage of a pretty nice wx with a scramble or two before the snow starts to pile up around the Rockies. 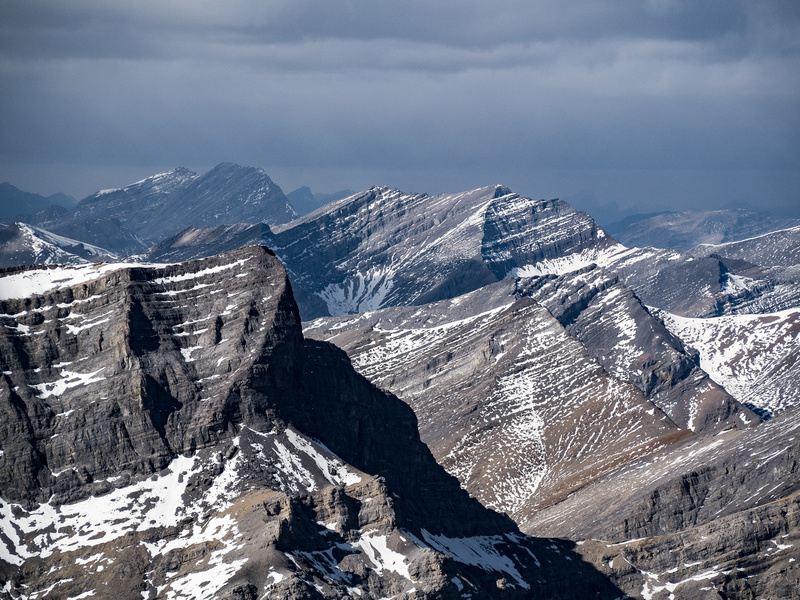 Lucky for me, I received an invite from two recent scrambling acquaintances in the form of an email from Cornelius Rott and Trevor Boyce, inviting me for a jaunt up the relatively obscure front range “Castle Rock” peak in the front ranges of the Ghost Wilderness Area just east of Banff National Park. Castle Rock is a very dramatic looking peak, especially when viewed from the east. 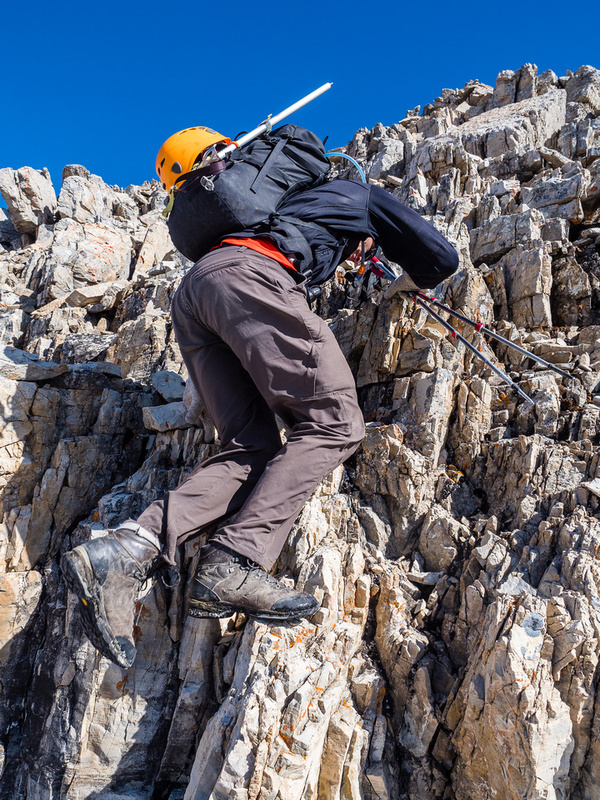 I first laid eyes on it’s foreboding summit rock walls while climbing the deservedly popular Devil’s Head, which is located just to the east of Poltergeist, Astral and Castle Rock. Despite very incorrect elevation labeling on some maps, Devil’s Head is the shortest of any of the four peaks in this area by several hundred feet at least (not nearly the 2997m as indicated on ViewRanger). The eastern aspects of Poltergeist, Astral and Castle Rock all look impregnable – and for the average person they most certainly are! 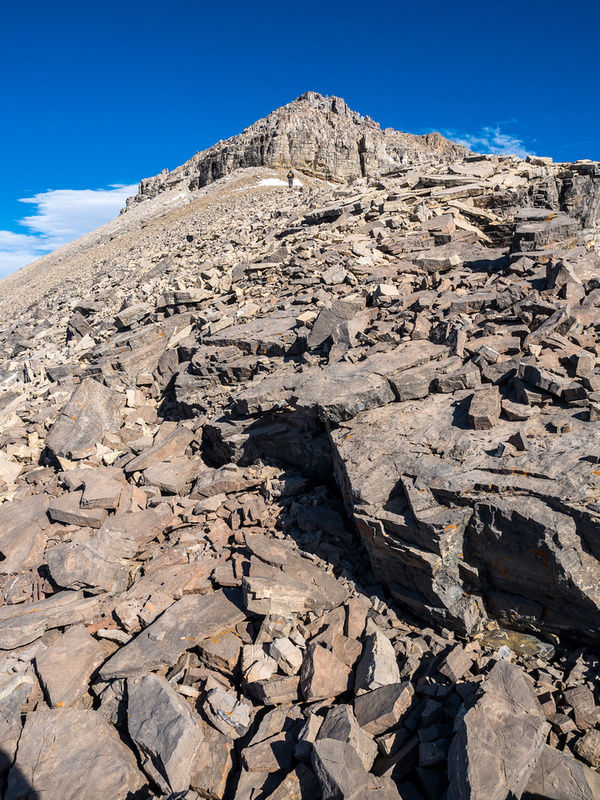 Apparently Cornelius and Trevor had discovered a passage that allowed them access to the summit of Astral Peak only a week before, and were so enthralled with it that they wanted to go back and apply their route beta to its neighbor – Castle Rock. 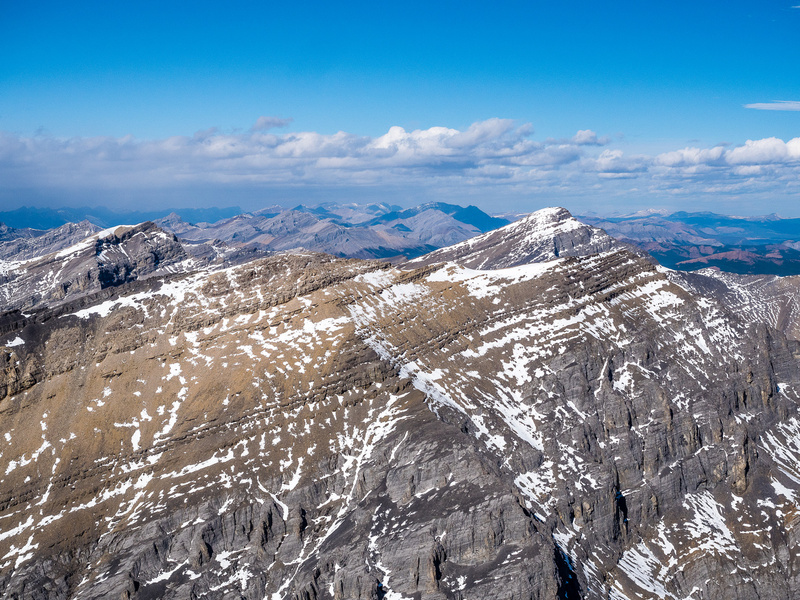 I was certainly game to tag along and gain insight into a new area (for me) of the Rockies and a possible ascent of a relatively unknown (or at the very least, undocumented) summit. Obviously I’ve been to the Ghost Wilderness Area before, but every time I venture into it, I wonder why I don’t spend more time there. 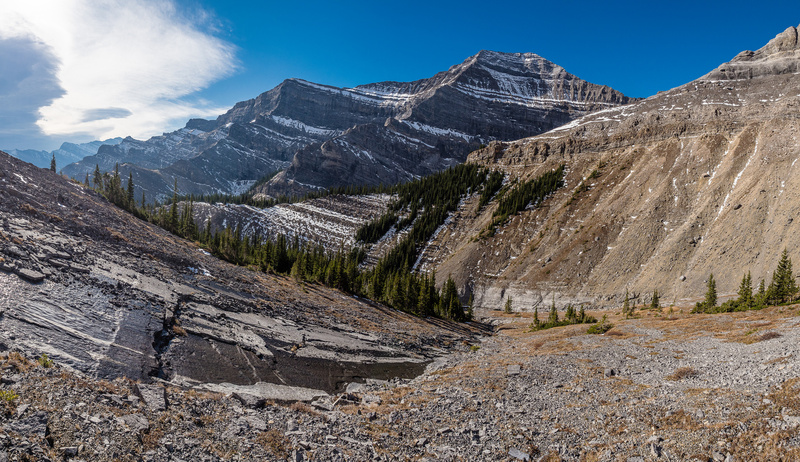 The combination of soaring limestone towers, rock buttresses and gushing rivers and streams with stunted trees and dry ridges is very unique and makes for some surreal landscapes and summit panoramas. 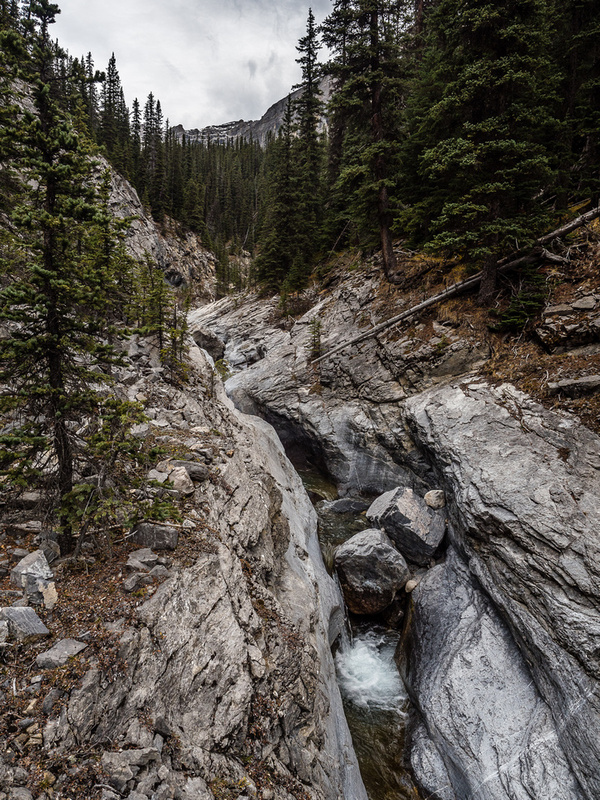 Ice climbers have been drawn to this area for years, thanks to it’s penchant for forming water ice and retaining little snow – being a front range it’s in the rain shadow of the Rockies. 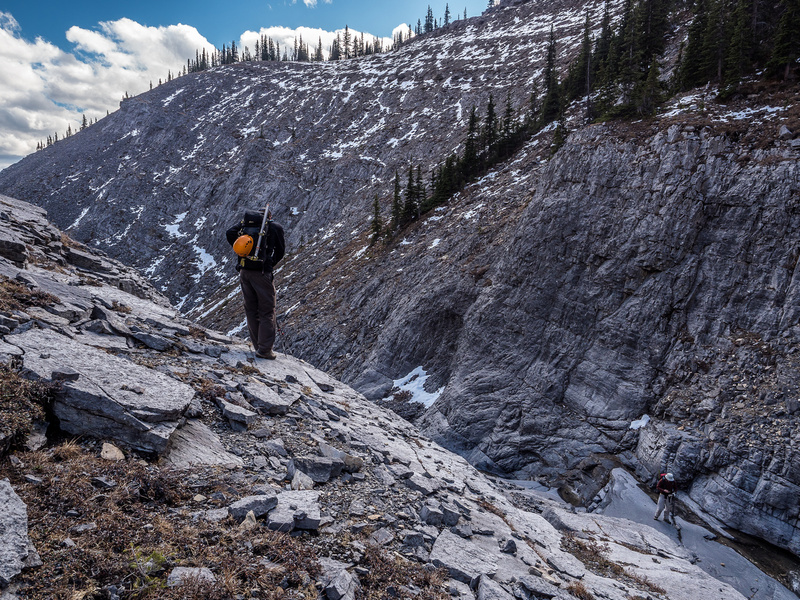 For a sample of the ice climbs in the area, check out the K7 Climbing web site or Gravsports. 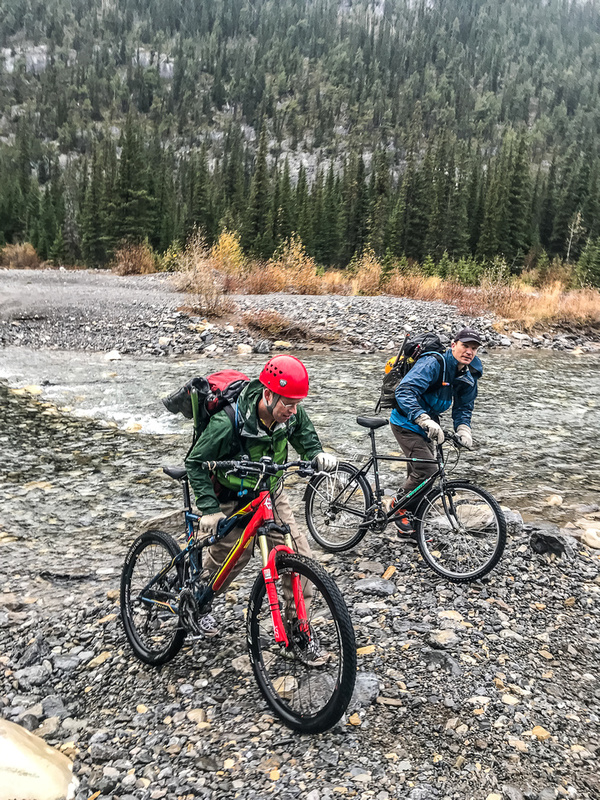 We met in Cochrane at around 05:30 and Cornelius used his and Trevor’s previous weekend ascent of Astral Peak to navigate expertly to “marker 39” where motorized travel is prohibited up the Ghost River valley from April 02 to November 30th each year. People seem to violate this restriction quite often, but we chose to do our part in protecting this unique landscape and biked the last 6.5km to the start of the Malamute Valley and lower reaches of Claw Creek. 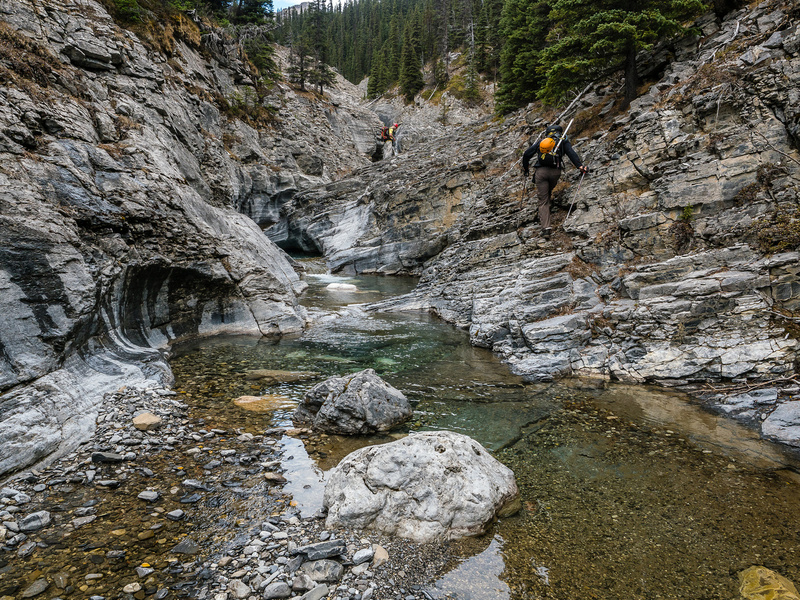 Trevor had counted 9 crossings of the Ghost River on the Astral trip, and he and I came prepared with our fishing waders. Cornelius wasn’t so lucky. 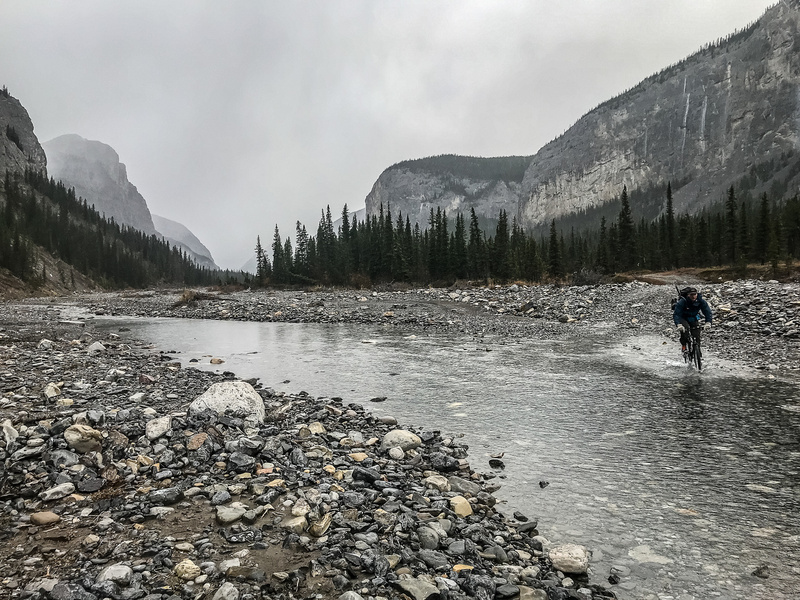 He had a very cold approach – every time he crossed the Ghost River he’d have to continue on his bike with wet clothing until the next crossing made him wet again. 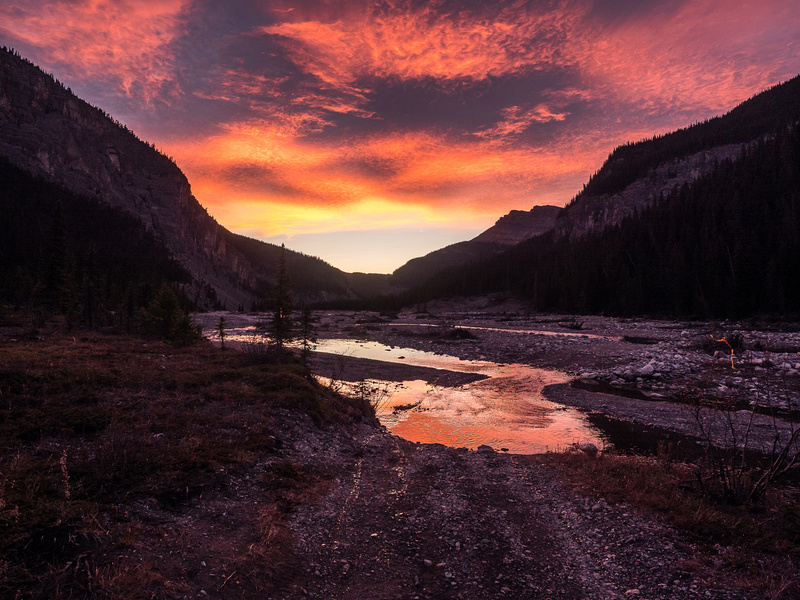 Remember – it is now fall and the temperatures weren’t that far above freezing! We rode our bikes beneath a slowly brightening morning sky, albeit much cloudier than expected. 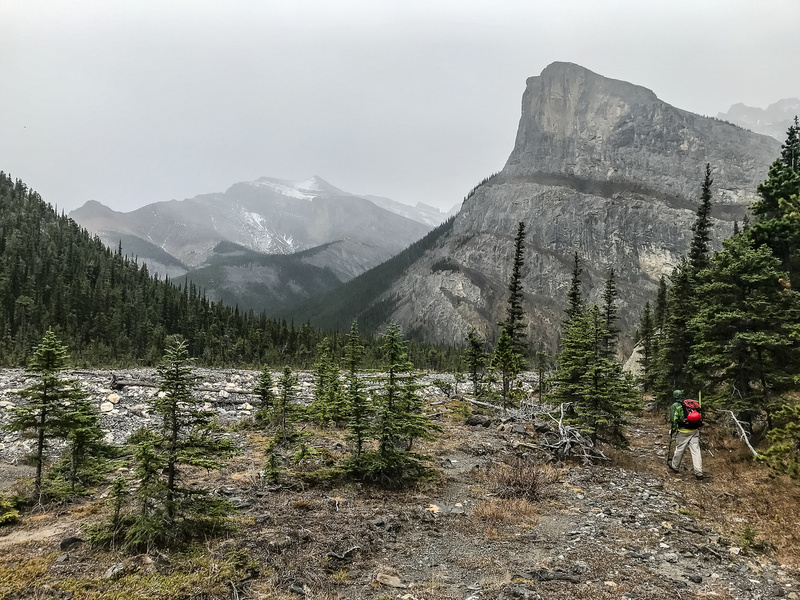 Trevor gave us the bad news that the wx had changed that morning from mostly sunny to showers in Banff starting up that afternoon. The beauty of the area dulled any disappointment we might have felt in the wx changes. 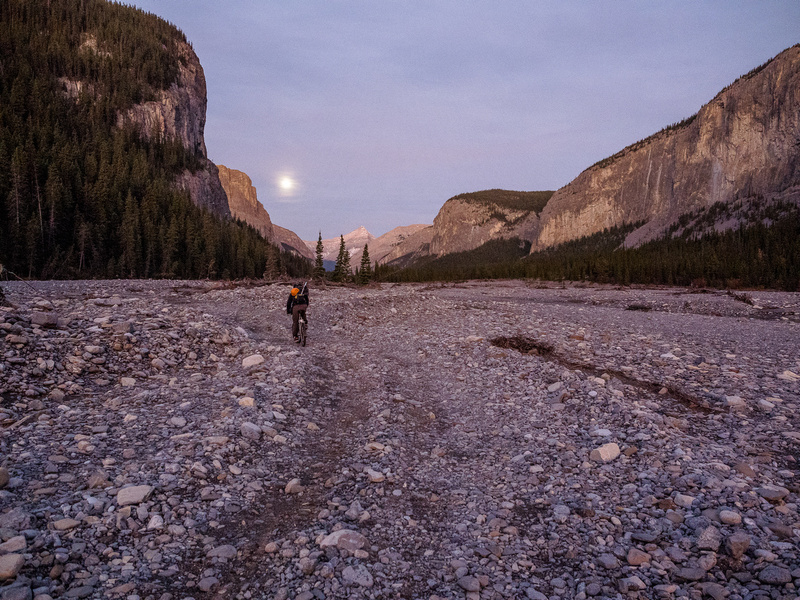 Biking up a surreal landscape along the Ghost River with a very bright moon providing any light we might still need (it’s still much darker than this photo implies). Within about 30 minutes of leaving marker 39, we were turning right (north) up the western edge of the wide Claw Creek outwash. 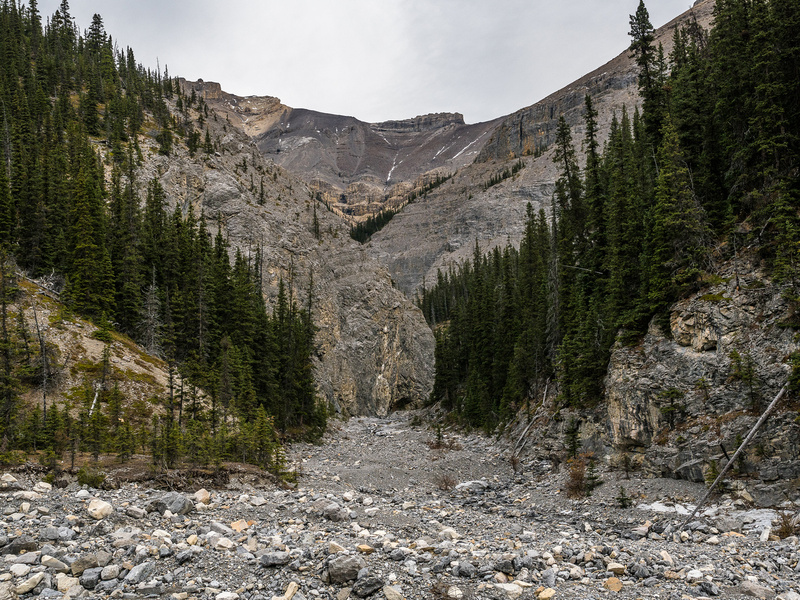 The main road continued up the Ghost River valley but there was a sign stating “No Vehicles” beyond the Claw Creek turnoff. We stashed our bikes soon afterwards, near a fire pit at the end of the road. 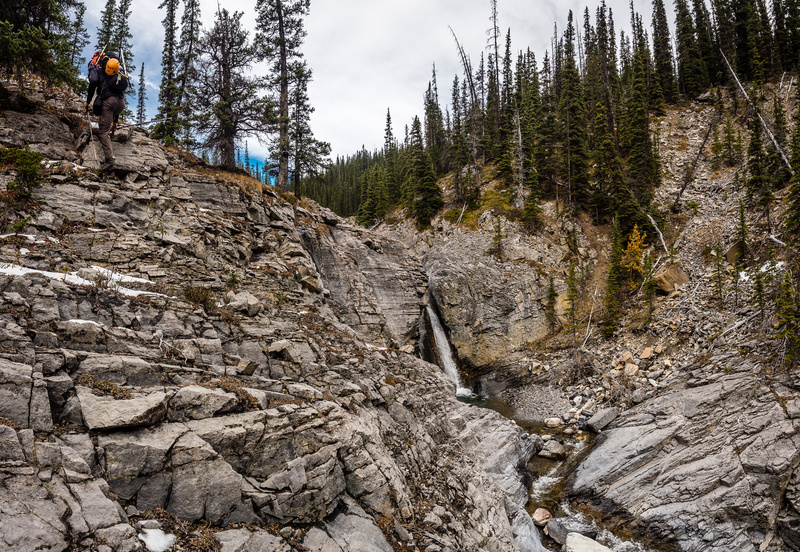 After donning hiking boots, we began the long march up Claw Creek and Malamute Valley. 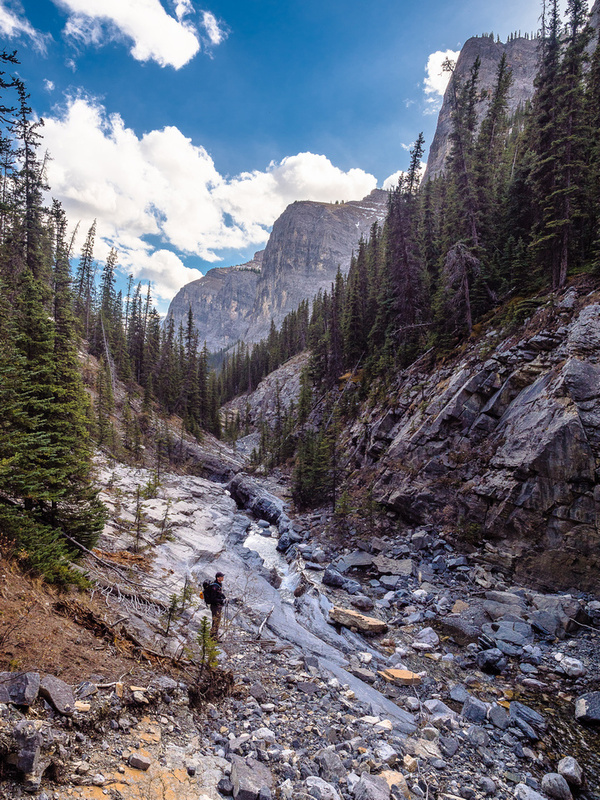 If you’ve never been to this area of the Rockies before – and chances are high that you haven’t – be assured that it’s a very special one. As the impressive rock walls of Poltergeist, Astral and Castle Rock started to close in on all sides, I was struck by a thought that was echoed aloud by Cornelius just as I was thinking it. It’s not the first time I’ve had it either. I should not be sharing this trip with anyone else. I should not post this one on my site at all. 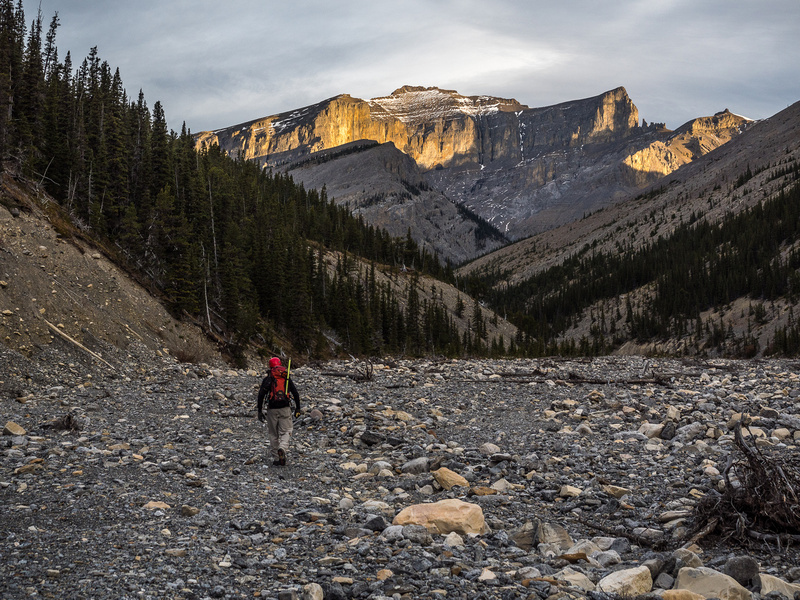 If you’ve read some of my other trip reports or had discussions with me on this topic in the past, you already know that I constantly struggle with the idea that I’m taking away some of what makes certain areas of the Canadian wilderness so special, with my public explor8ions. There are trips (such as this one) that I will intentionally not share on social media, but who am I kidding? It’s only a Google search away and many folks follow my site closely anyway. In the end, Cornelius and I share the opinion that we don’t “own” these special places, and if we can get people to care about them (by experiencing them personally), than maybe it’s worth the public exposure. I don’t know. 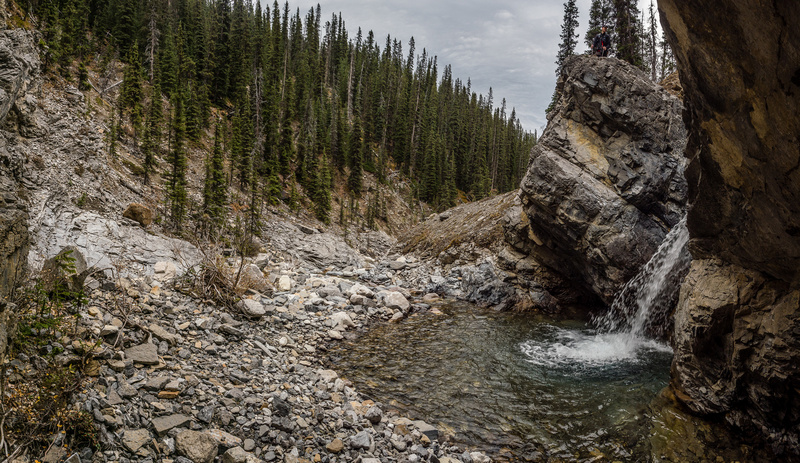 For most folks, even just the drive to marker 39 is way too much bother, nevermind biking another 6.5km with 9 river crossings before boulder hopping for many more kms up a remote creekbed to an easy scramble. I don’t think Castle Rock is in any danger of becoming the next “Ha Ling” or “Yam”. For now I choose to assume that only those who respect and admire the landscape like I do, will even bother attempting trips such as this one. 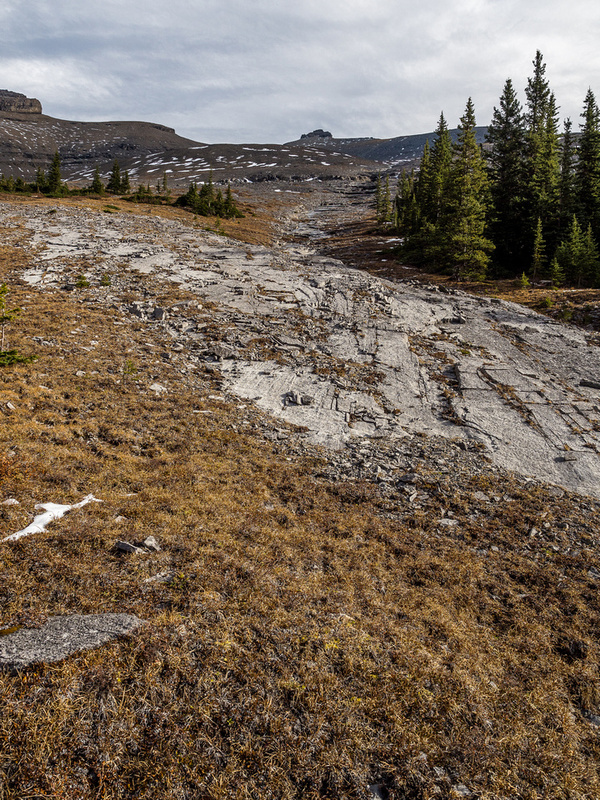 There’s also the reality that Gillean Daffern has had the Malamute Valley advertised openly in her very popular hiking guides for 20+ years, and we couldn’t find any evidence of human travel beyond the turnoff to the Fang & Fist ice climbs. 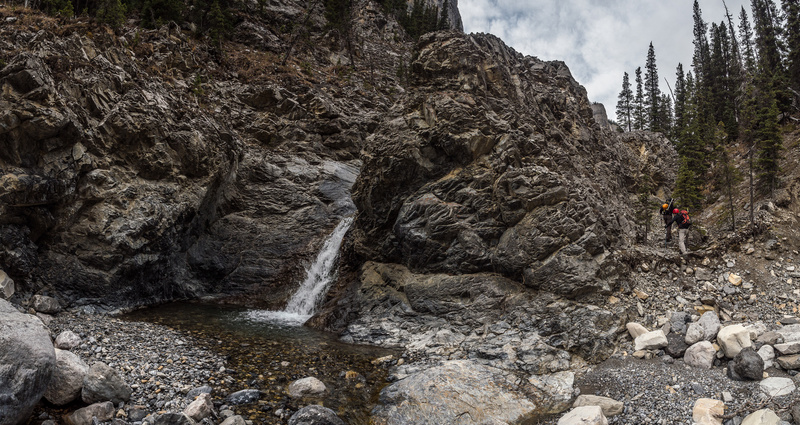 Obviously this is a forgotten corner of paradise – especially outside of ice climbing season. Starting up the Malamute Valley with our peak rising far above. The Fang & Fist valley is at center distance here, we will stay left and continue up the main valley. 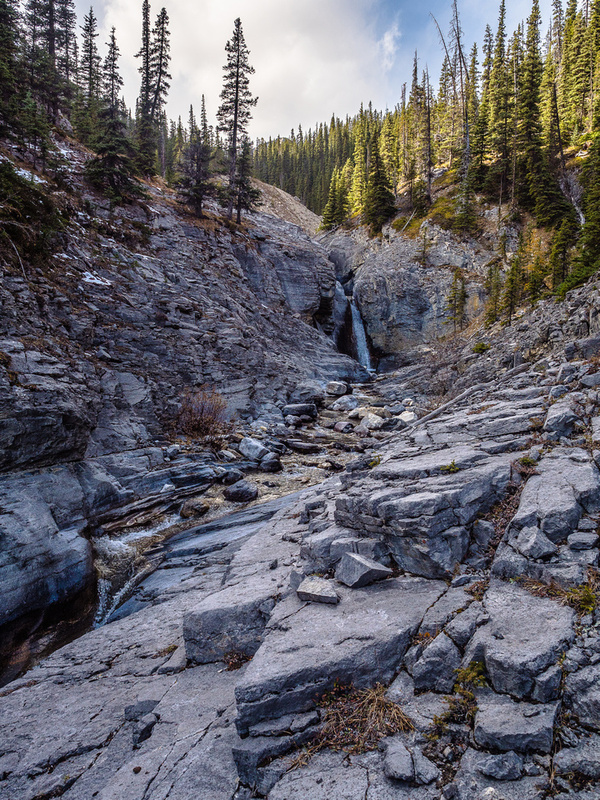 There are many of these sublime little falls along Claw Creek. Almost every one of them has to be bypassed on either the right or left side. One of the most gorgeous sections of the creek had a natural bathtub feature. 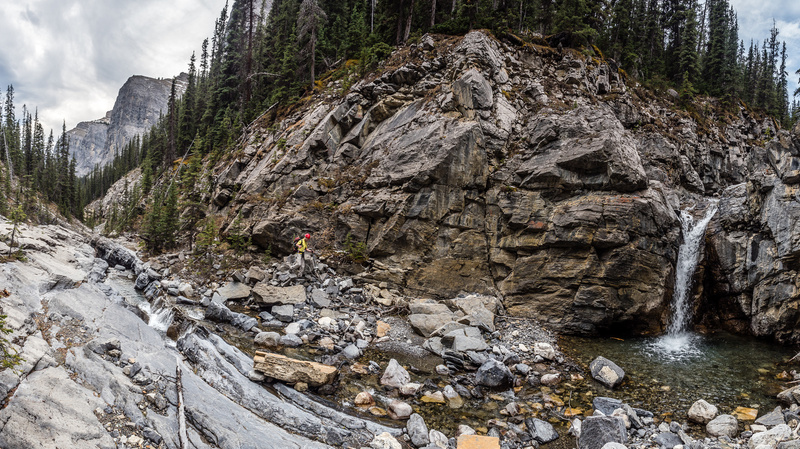 Nice ledges to ascend along the creek. Nearing the Astral Peak junction now, as we navigate yet another waterfall bypass. Note the blue sky ahead? That was nice! 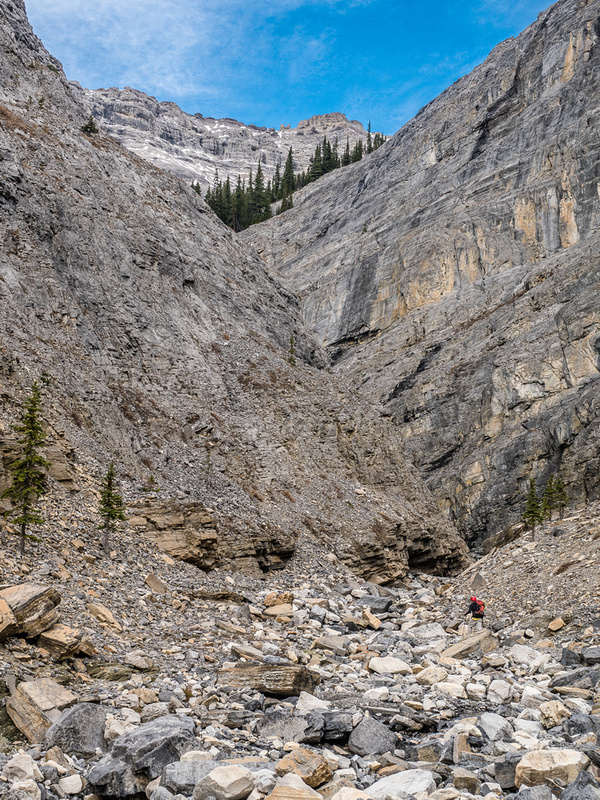 Trevor looks pretty small as he enters the sharp bend in the canyon. Needless to say, I was quite impressed with the Malamute Valley. I’m not 100% sure if Claw Creek includes all the upper tributaries beyond the Fang & Fist branch, but I’ll assume that it originates on Castle Rock’s SW slopes and includes our entire route. 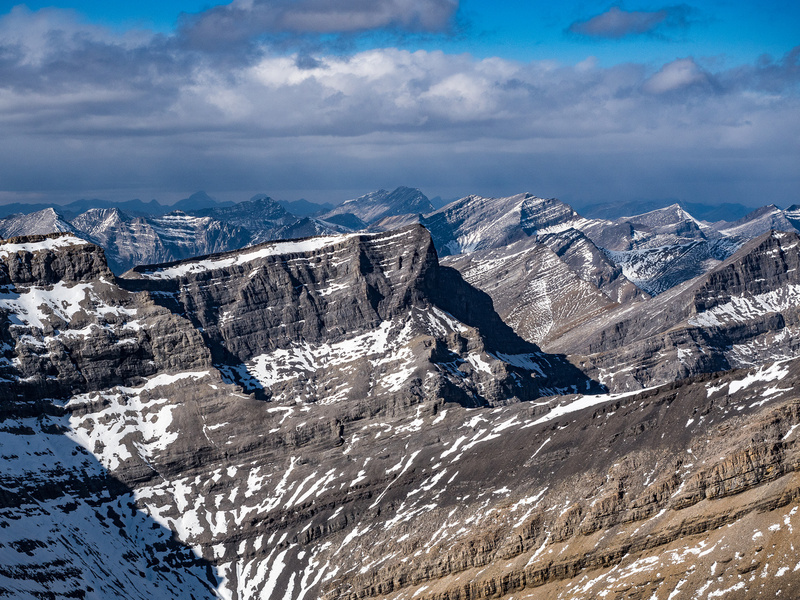 Considering its name, it should include the Astral Peak approach valley too. 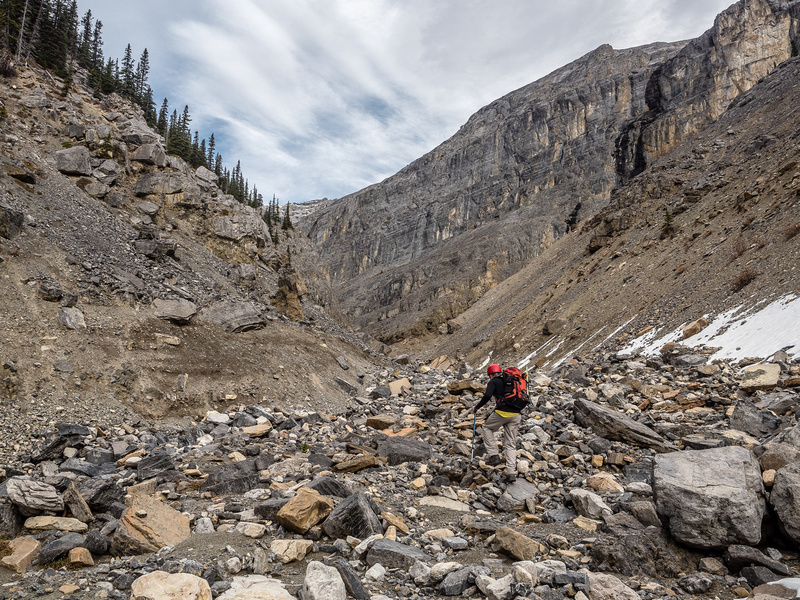 I’ll also assume that the Malamute Valley is the entire canyon that we ascended – not just the widest, initial section. 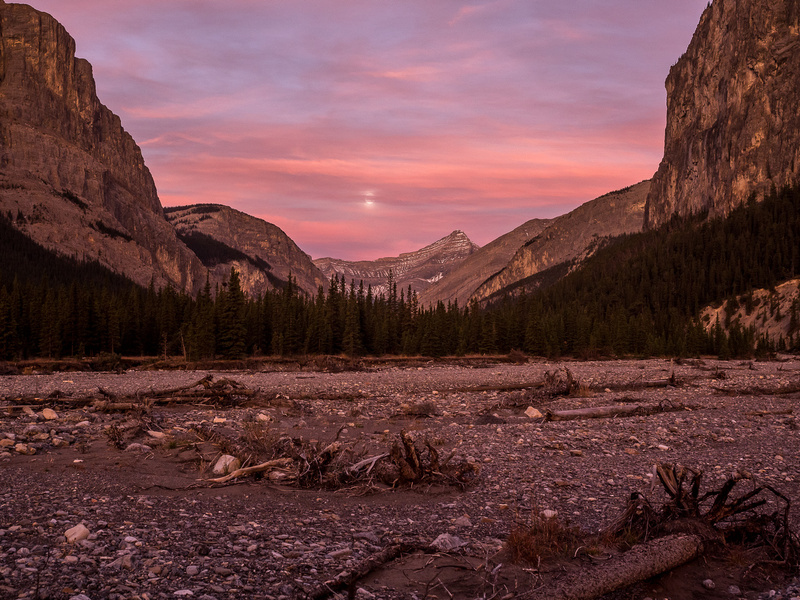 I will let the following photos do most of the talking about the canyon and creek approach as there’s not much more to say about it, other than that it’s a very special, unique and pristine landscape. There were absolutely no signs of humans after we passed the branch for Fang & Fist other than a few pole marks and the odd track from Cornelius and Trevor the week before. There was no garbage or human detritus of any kind on the entire route. 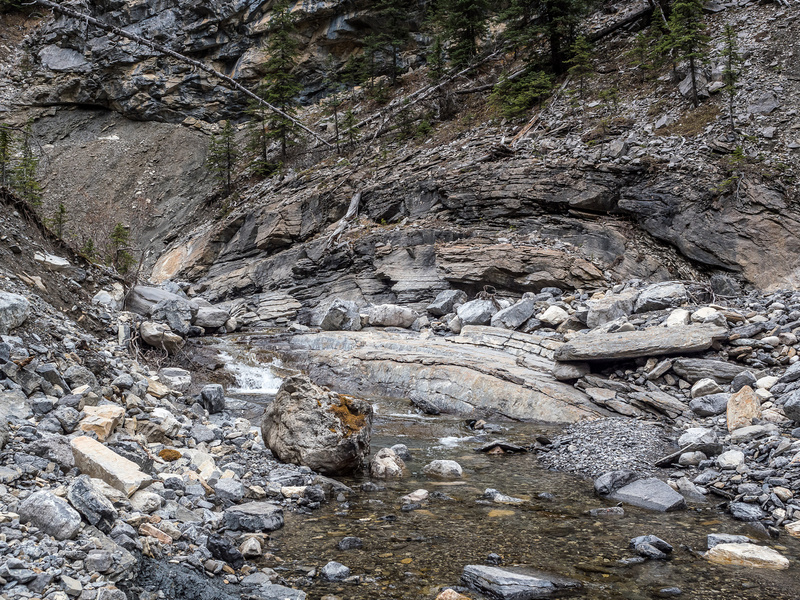 There were no human trails in the soft dirt lining the steep banks of the creek. There were no voices other than our own, echoing off the brooding rock walls looming over us. 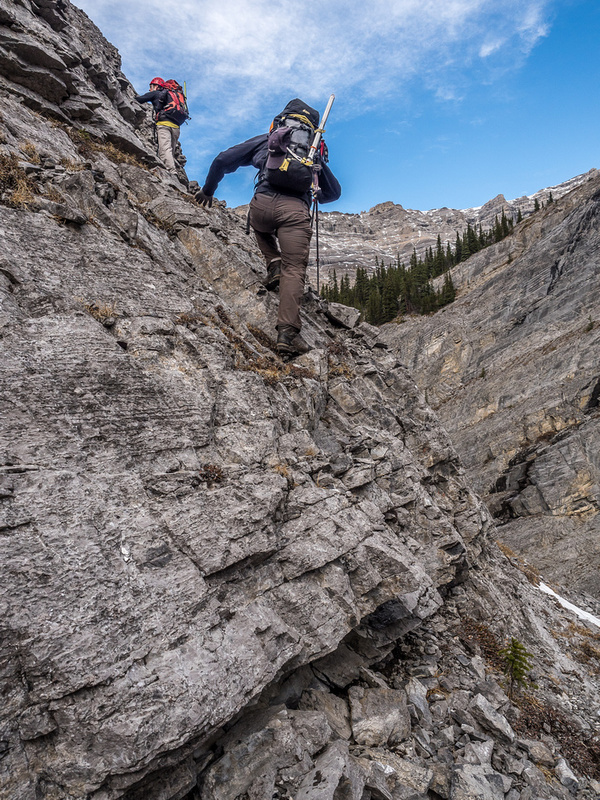 There were no visible bolts or ropes hanging down the steep buttresses lining our route. There was no toilet paper half buried or discarded thoughtlessly anywhere along the route. It was awesome. 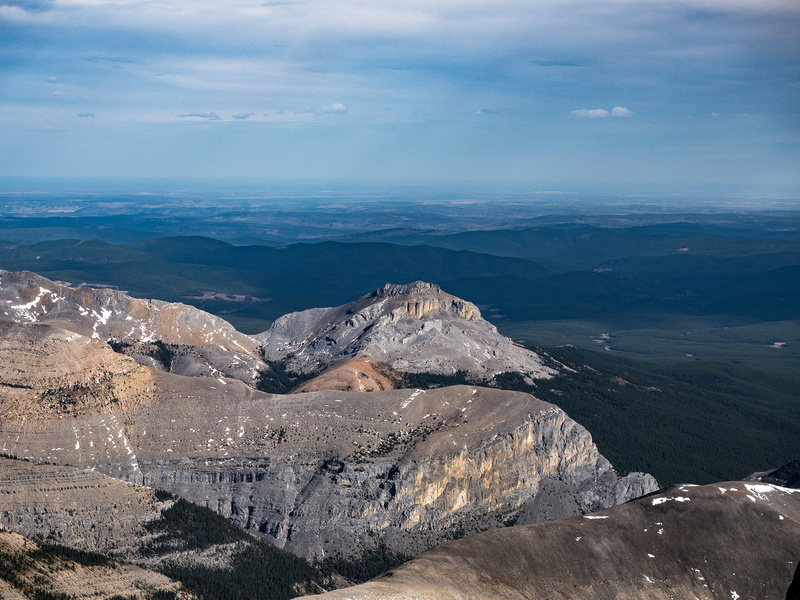 I’ve been quite disappointed in some other corners of the Rockies this summer with the reckless actions of my fellow species and it was nice to see this little corner of the Rockies relatively unscathed by our kind. 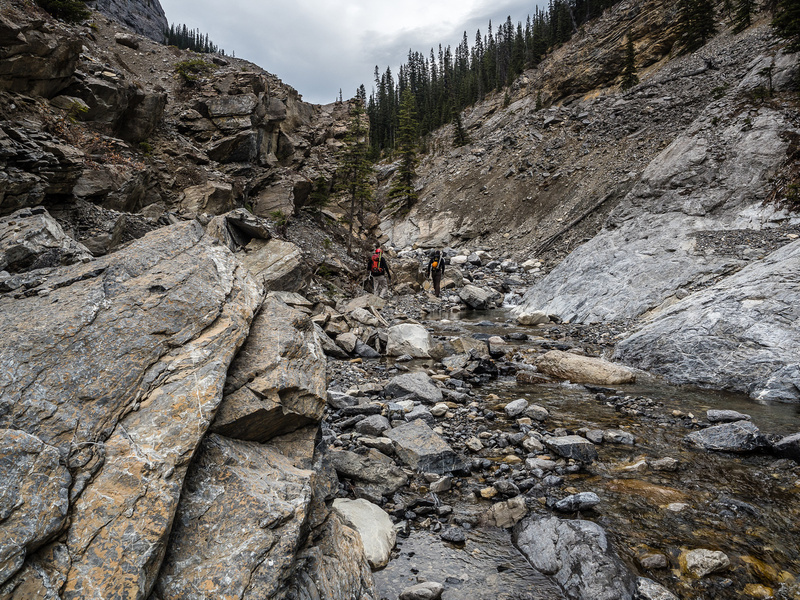 We stuck to the creekbed for almost the entire approach, other than a few necessary detours around waterfalls or other obstacles, which were all quite obvious. After 2.5 hours of rock hopping, creek crossings and waterfall detours in the depths of Malamute Valley, we finally came to the Astral Peak junction which Trevor and Cornelius had traveled the week before. Beyond this point was pure explor8ion for all three of us and we were all very excited for it. 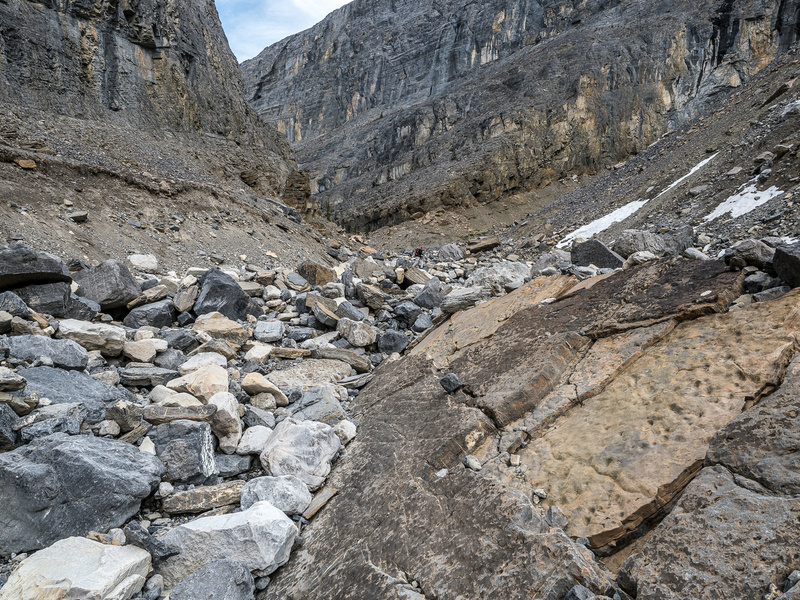 The next kilometer of the main canyon was not visible for Trevor and Cornelius from their Astral Peak excursion – we had absolutely no idea if it would go or not. We were like young boys again, exploring an unknown world where any step could either reveal a path forward, or an impassable obstacle. Trevor got way ahead of Cornelius and I – his enthusiasm for forging ahead into the unknown was infectious. I have to say, it didn’t look great at first. 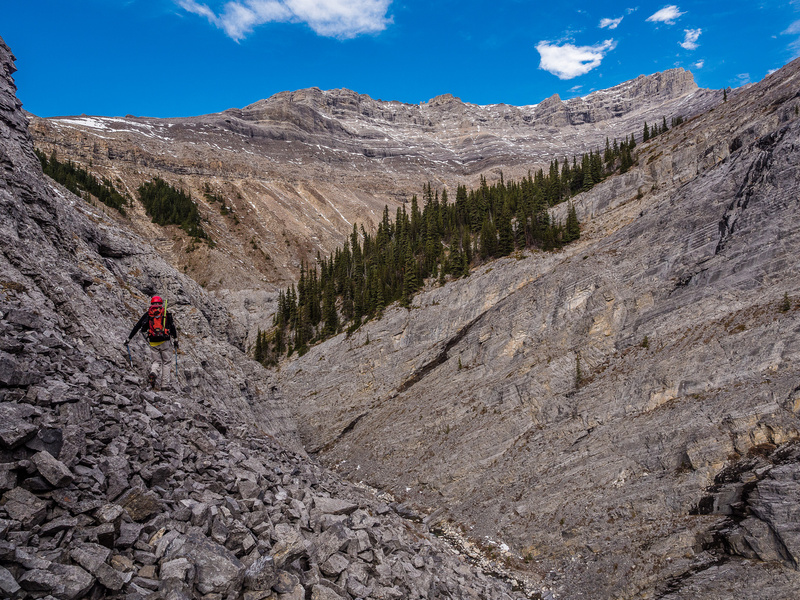 Almost immediately after passing the Astral Peak junction, the canyon turned sharply left (west) avoiding terrifically steep and sheer cliffs plunging off Castle Rock above. 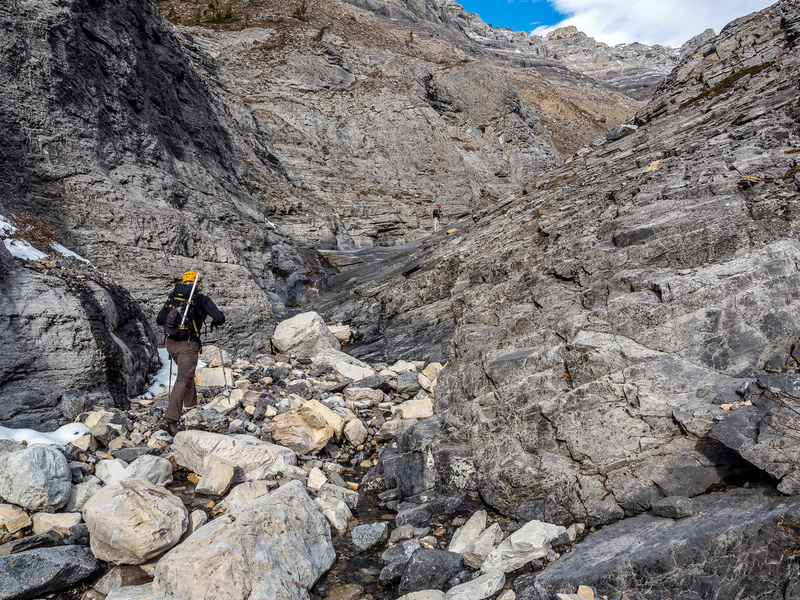 More cliffs, coming off the south ridge of Astral Peak, forced the creek into a chasm that appeared alarmingly narrow and fragile as we cautiously entered it. Sure enough! 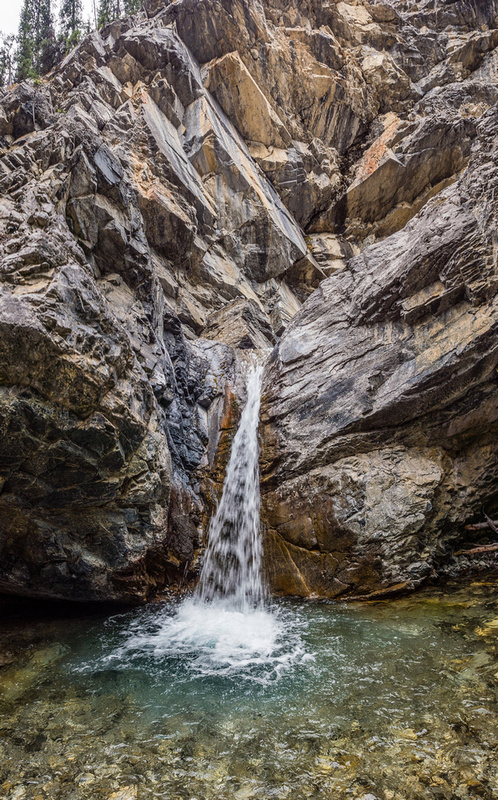 As Cornelius and I followed Trevor around the sharp bend in the canyon, we immediately noticed yet another waterfall in the creek. So far we’d managed to bypass every single one of these natural obstacles on either side of the creek, but this time we weren’t going to be so lucky. Both sides were sheer cliffs. What to do now? We did have choices, thank goodness. Our day wasn’t over just yet. 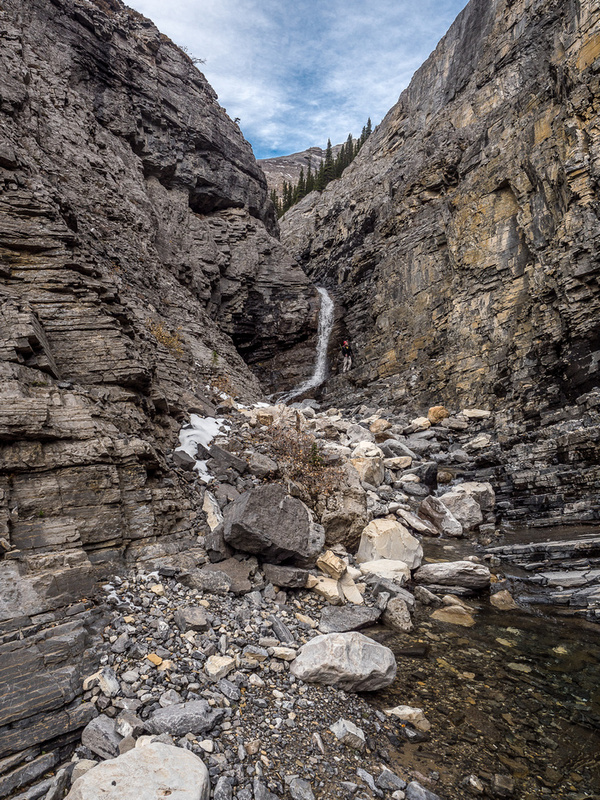 The first obvious choice was climbing small, slick ledges on climber’s right of the falls. Trevor quickly backed down that attempt. 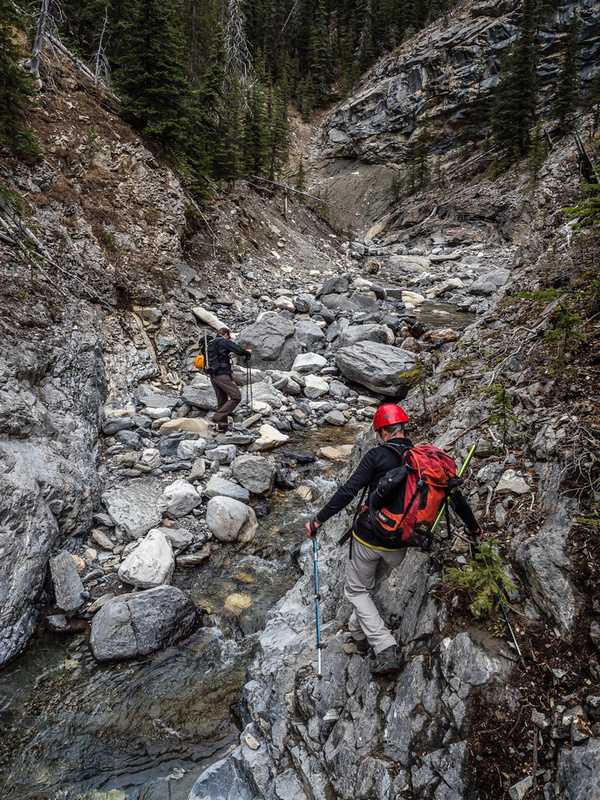 The next obvious choice was to somehow ascend and traverse along downsloping rubbly ledges on the north side of the creek that didn’t look very easy or appealing. We were left with two remaining options. We could backtrack the creek towards the Astral Peak junction and ascend the south ridge of Astral, hoping that it would allow us into the upper stretches of Claw Creek above the narrow canyon section, or we could ascend very steep, but ledged terrain on the south side of the creek / canyon. 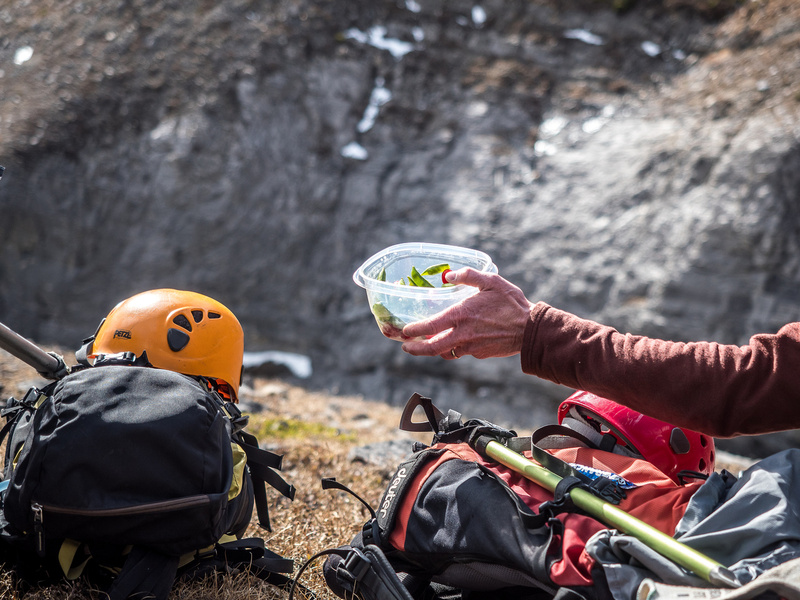 We were in the mood to scramble, so up the steep terrain we went! 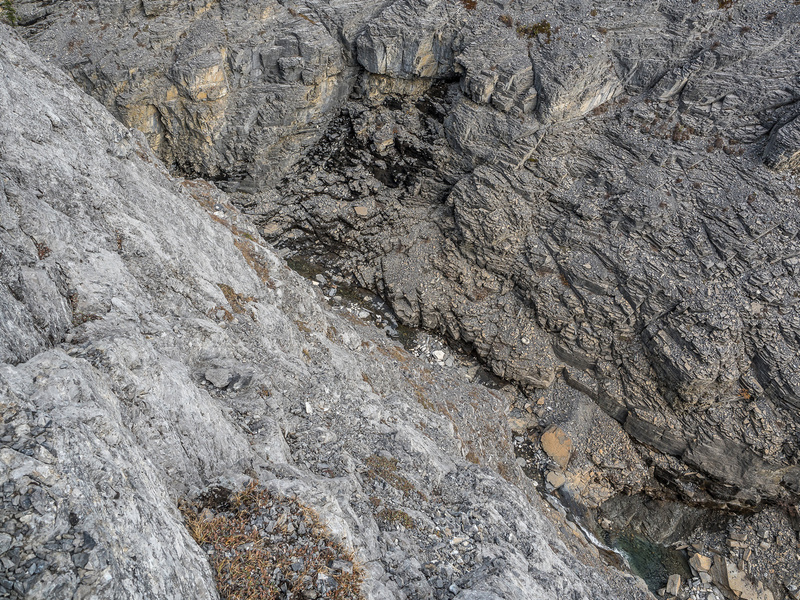 Although on hindsight this short section of difficult scrambling was entirely avoidable, I’m still happy we did it. It was fun. All too soon the exposure angled off and we could see a reasonable slope leading back down to a more gentle canyon above the waterfall that had blocked us. Avoiding the waterfall in the canyon. Certainly difficult you-don’t-want-to-fall terrain and very loose but blocky. Looking back over the canyon that we approached from. Time for a break before the 500m slog to the summit. 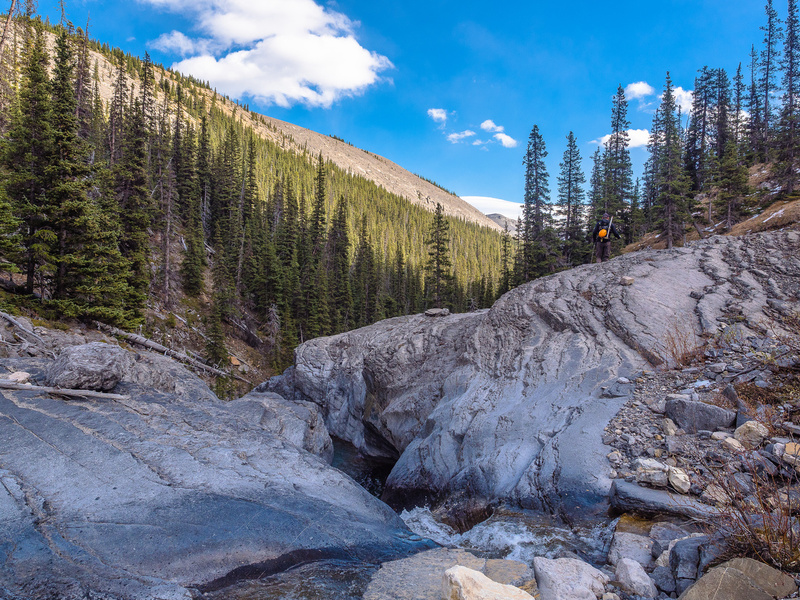 Trevor led the way up the slabby watercourse as it angled back to the right (north) and gave way to the expansive south and west slopes of Castle Rock. Soon after starting up these slopes we stopped for lunch. It had taken us 4 hours from marker 39 to bike and then pass through the entire length of Malamute Valley. We weren’t moving slowly and Trevor and Cornelius knew exactly where to bypass the creek on approach thanks to their Astral Peak outing a week earlier. I think 5 or even 6 hours from marker 39 would not be an unrealistic plan for most parties. 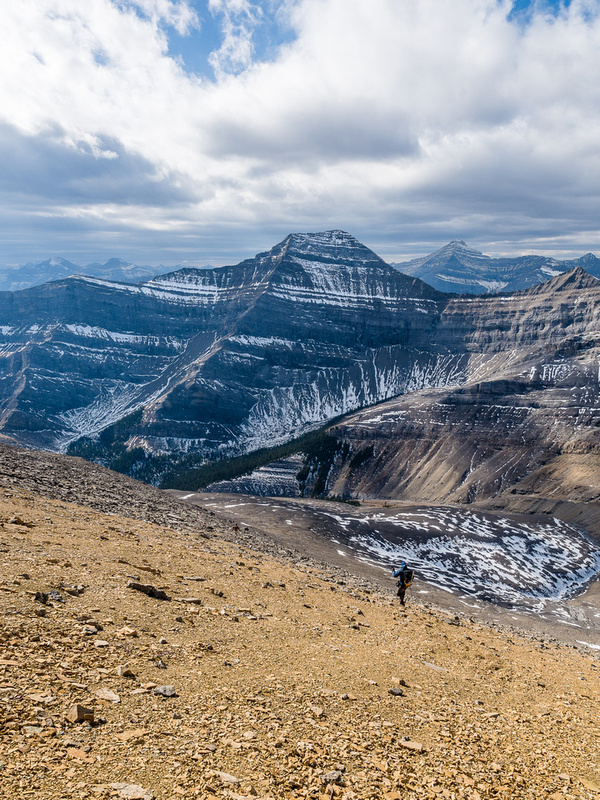 After lunch we pointed ourselves towards the distant summit block and started blasting up endless, easy angled, scree slopes running up under the impressive cliffs of Astral Peak and away from Poltergeist. Cornelius took off at this point! He must have been feeling great because neither Trevor or I could catch him. 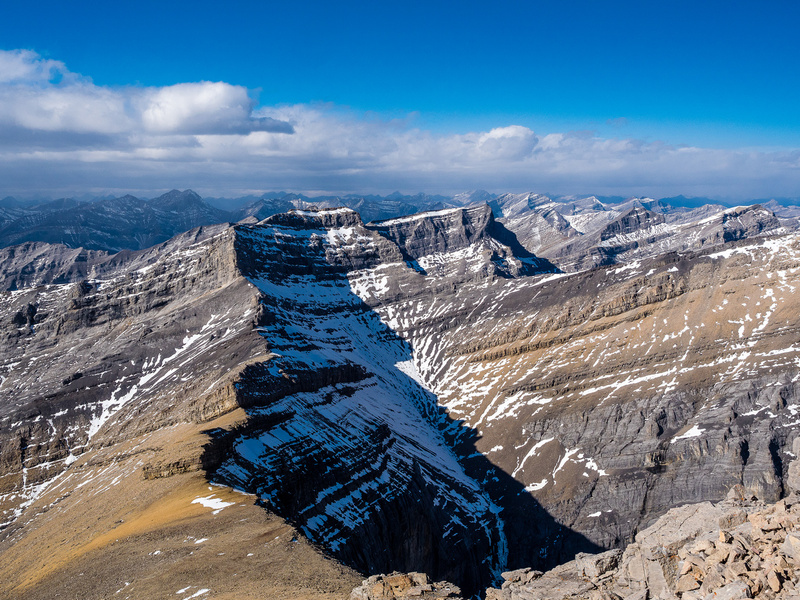 So far we’d been really lucky with the weather – our little corner of the Rockies seemed to be the only one with sunshine and blue skies. As we ascended we could see clouds to the east and clouds to the west. 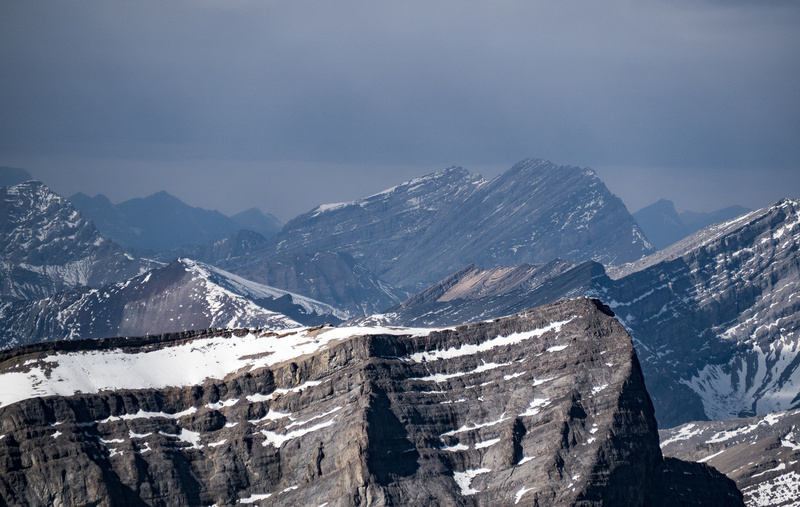 The forecasted weather front seemed to be hammering Banff and we were a bit concerned that the winds were getting very strong around us too. Sure enough. As we finally crested the ridge just south of the summit block, the wind gusts became very fierce and almost dangerous at times. I was walking along, leaning into the gale when it literally picked me up and moved me over a few feet! This was not good, considering the drop down to my right! 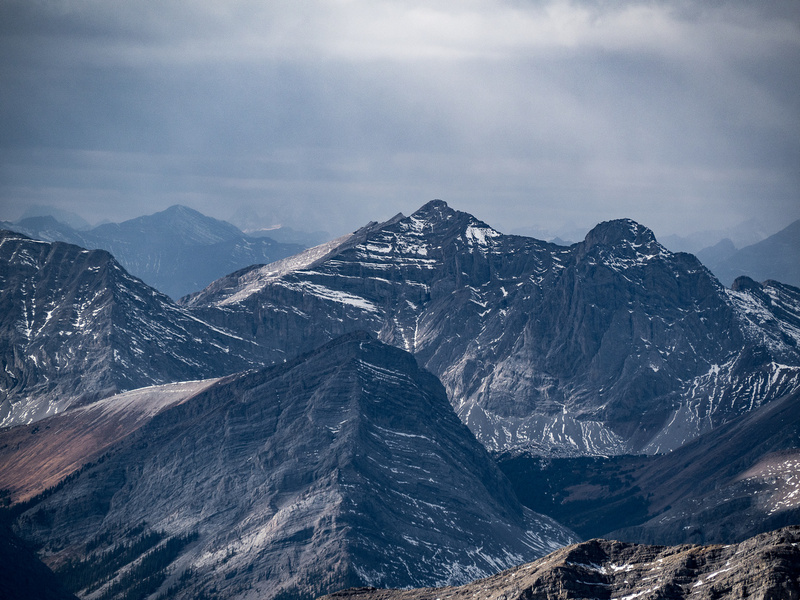 The views of Devil’s Head, Poltergeist and Astral were amazing from the south ridge. Costigan and Phantom Crag also looked impressive as did Mount Davidson to the north as we worked our way higher. I followed Cornelius up a moderate step in the lower summit block (avoidable on climber’s left) before we battled very cold and strong winds to the summit. It was a bit disappointing to find a small cairn built there (Astral Peak apparently had no evidence of any previous ascent), but there was no register. A tower just to the east of the summit looked to be as tall as the west summit, but certainly no taller. We didn’t bother checking it out in the brutal winds. We took as many photos as we could, before the cold temperatures forced us to beat a hasty retreat. Cornelius left a register in the summit cairn. Summit views looking east and south (R). Peaks visible include (L to R), Black Rock, Devil’s Head, Devil’s Fang, Orient Point, Costigan, Poltergeist and Aylmer. 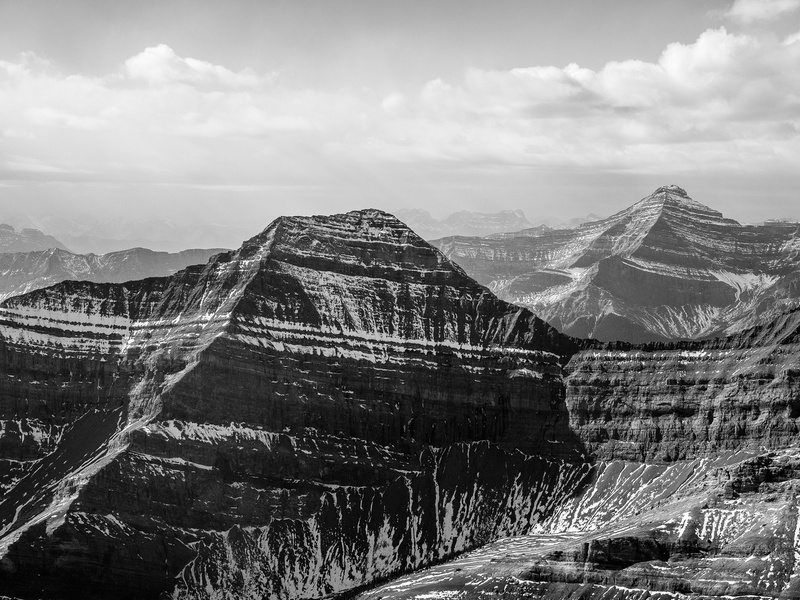 A B&W view of the dramatic clouds and scenery of the Ghost Wilderness Area. From L to R, Poltergeist, Aylmer, Brock’s Peak, Spectral, Apparition, Revenant, Astral, Haunted, Psychic, Puma, Oliver, Davidson. 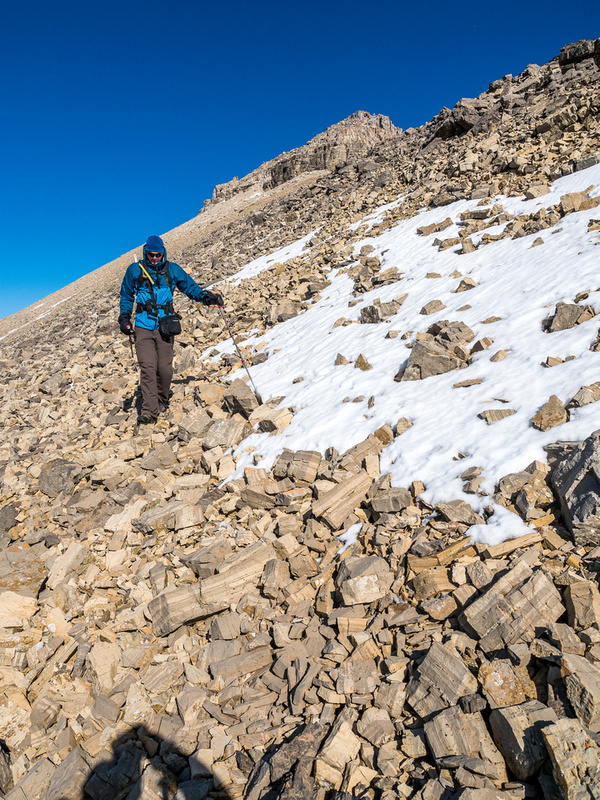 We all found easy descent lines off the summit block before quickly utilizing the scree slopes we’d ascended to get back down out of the intense winds. The weather was clearly moving slowly towards us as we descended. 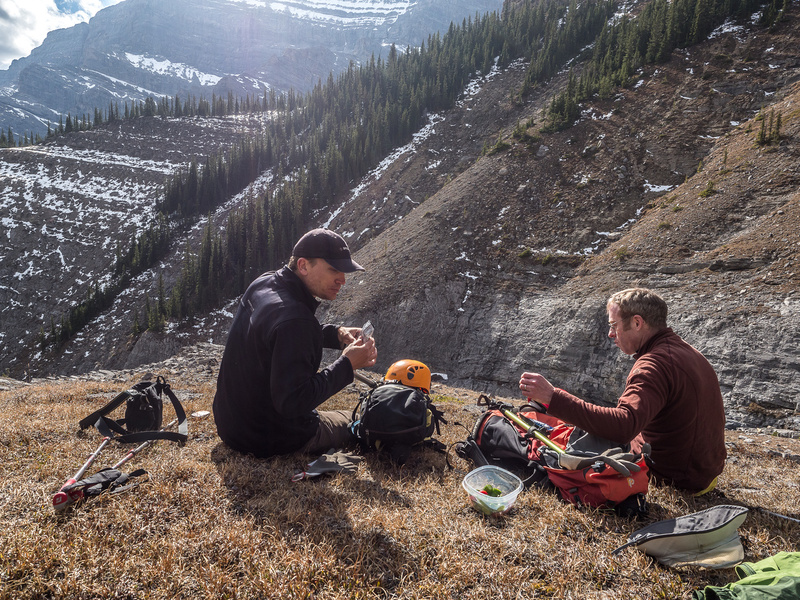 We took another break at the lunch spot above Claw Creek before descending into the creek bed and retracing our long approach path out of the canyon towards our bikes. 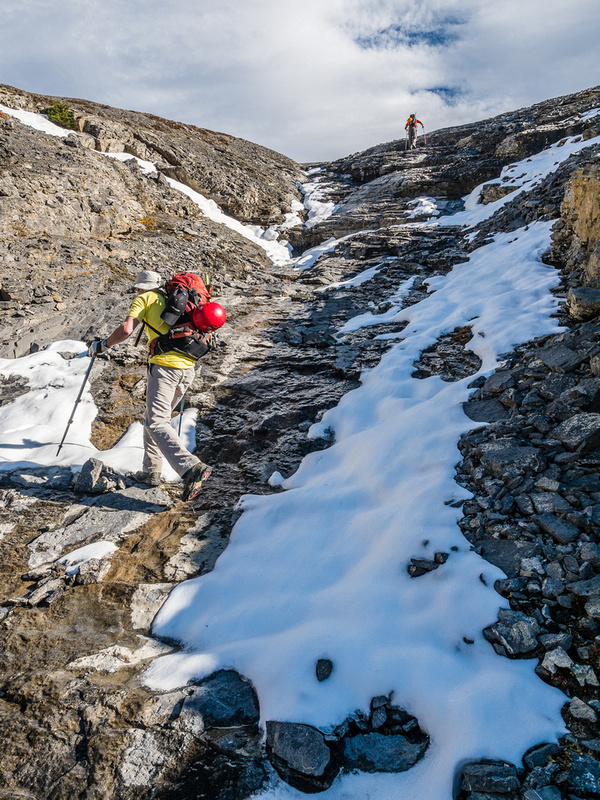 We managed to find an easier bypass to the crux section – sticking closer to Astral’s south ridge before descending VERY loose terrain to skier’s left and back into the creekbed downstream of the narrow canyon / waterfall. As we finished the last few kilometers of hiking in the wide lower valley we were being pelted furiously by wind, rain and sleet. Another interesting bypass in Claw Creek. The bike ride back to the truck was uneventful and surprisingly quick despite the rain and wind. Even though it felt flat on approach, it is apparently around 70m of height loss over 6.5km on egress, making it quicker than I expected. I was surprised to see our round trip time of 10 hours as we dismounted the bikes at the marker 39. For a ~30km, 1500m day this seemed pretty quick. I think 12-14 hours is probably a realistic time to expect if it’s your first time in this area and you’re not following Cornelius and Trevor! Obviously I loved this trip. It was everything that brings me back to the mountains again and again. 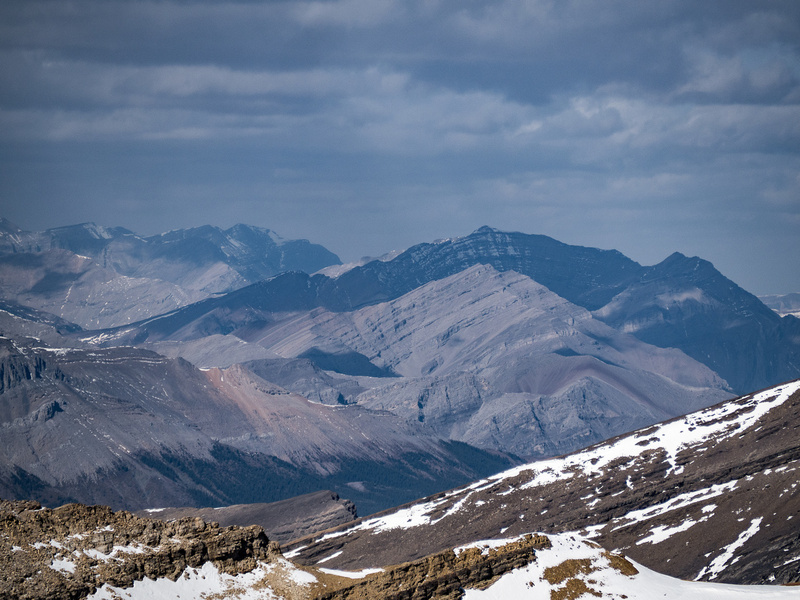 A true adventure with an unknown access route through wild canyon scenery and weather among a forgotten little corner of the Rockies. I will certainly be back to this area, sooner than later. All I ask of you is that if you ever summon the energy to visit the Malamute Valley – please, please continue to respect it the way any human visitors before us obviously have. Looking back at one of the numerous river crossings as day breaks dramatically around us. 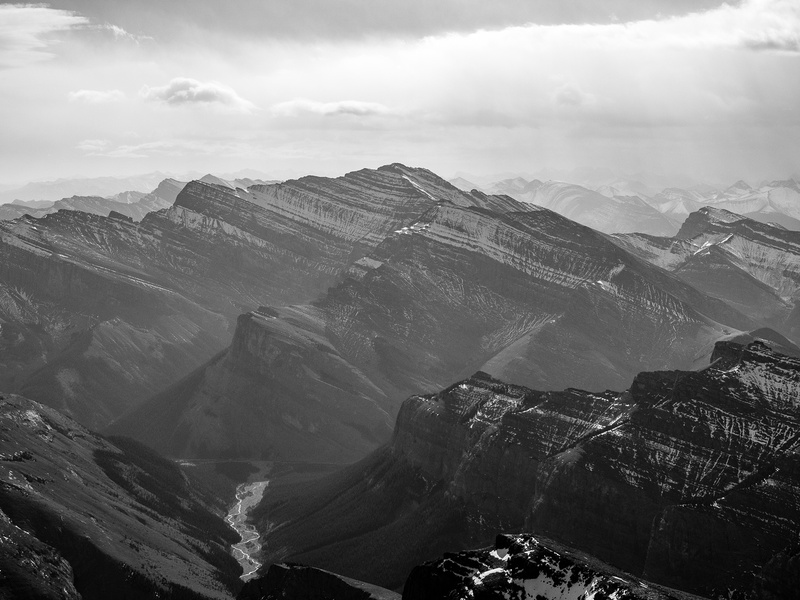 Gazing far up the Ghost River valley towards the 3162m high Mount Aylmer. Nearing the turnoff to the Malamute Valley. 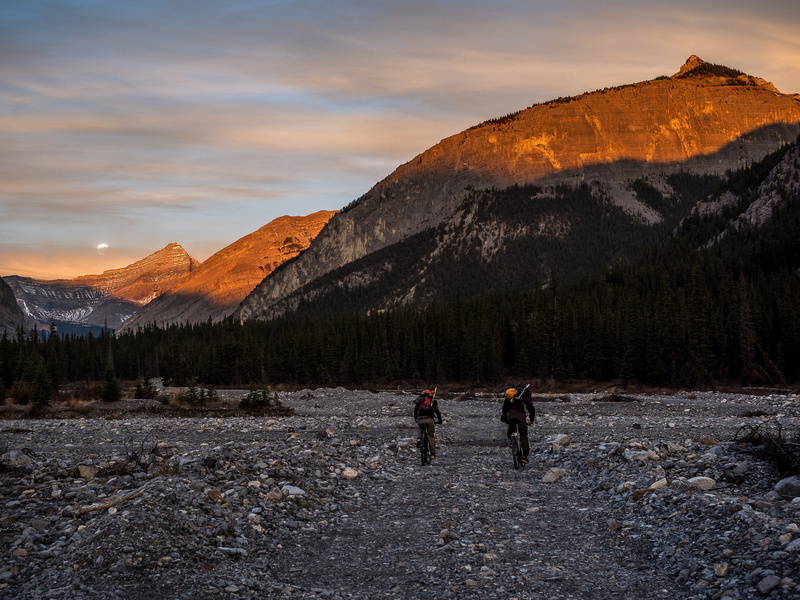 Starting up the Malamute Valley with our peak rising far above. The turnoff towards the Fang & Fist ice climbs and also an alternate approach to the west ridge of Devil's Head. 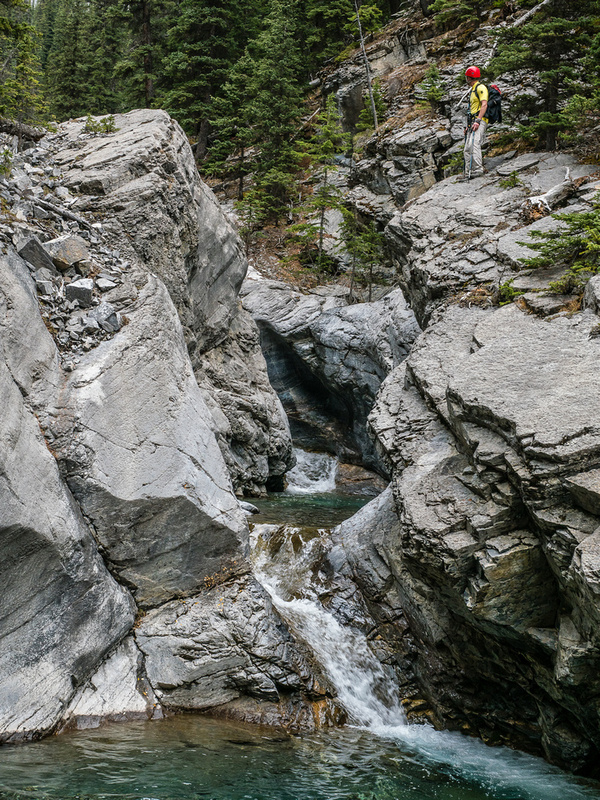 The geology of the creekbed kept the two geologists very engaged with their environment and taught me a thing or two as well. 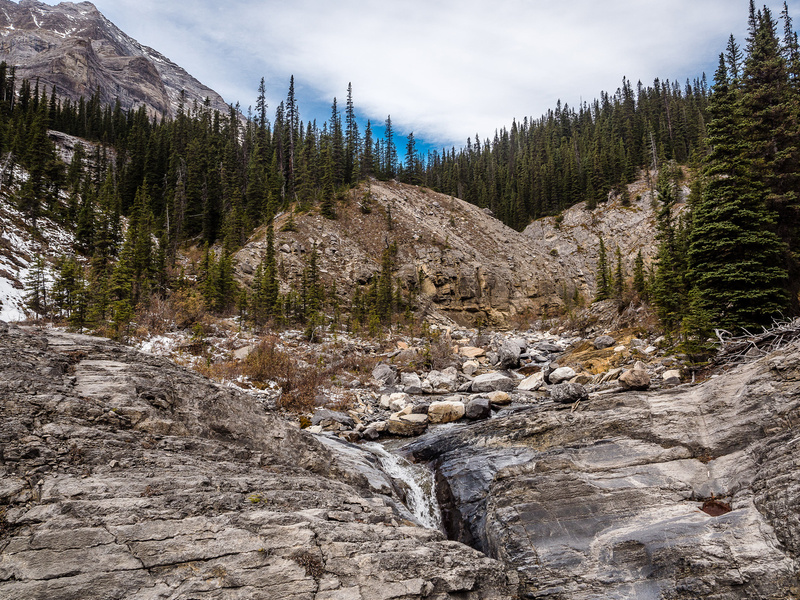 I was very surprised that in such a dry area, the creek was still flowing so vigorously. It makes me wonder if our route would even be possible earlier in the year? Both geologists got very excited by this obvious anticline along the creek. One of the most gorgeous sections of the creek had a natural bathtub feature. Too bad it's not a hot tub. 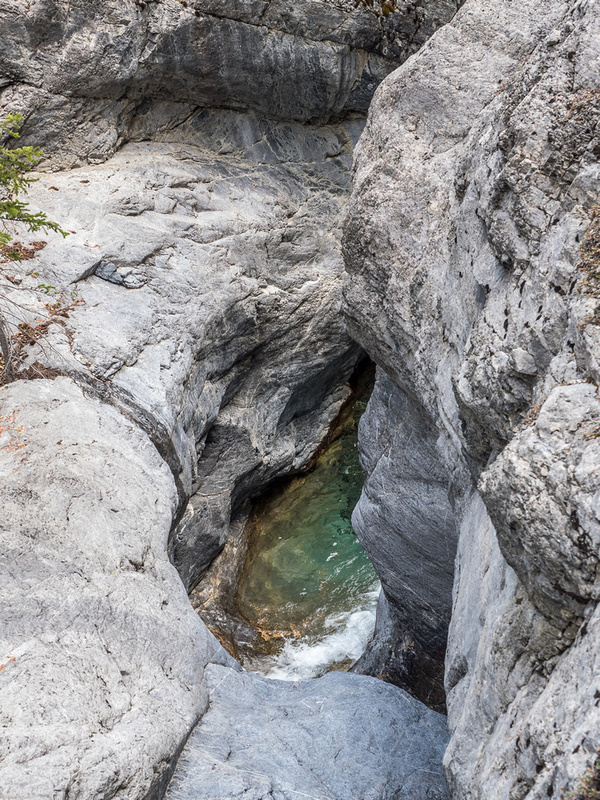 The canyon walls were impressively sheer and even overhanging in spots. It was impressive because they also looked to be extremely friable. 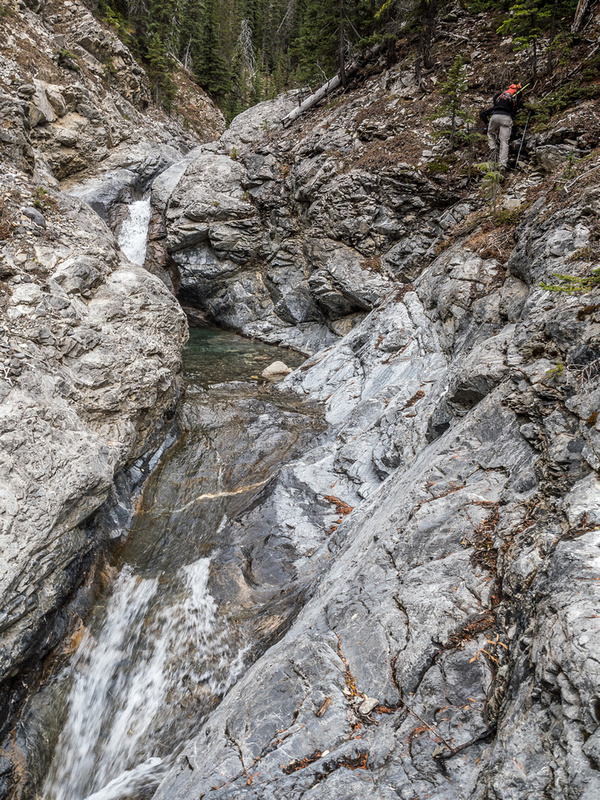 Cornelius jumps over a narrow section of Claw Creek. The Astral Peak junction is just ahead here - at right of center where the creek branches left. We stayed in the main branch. Forging ahead into the unknown! Trevor heads up valley towards menacing cliffs coming down off Castle Rock. Starting to feel a bit apprehensive as the cliffs close in on the creek. 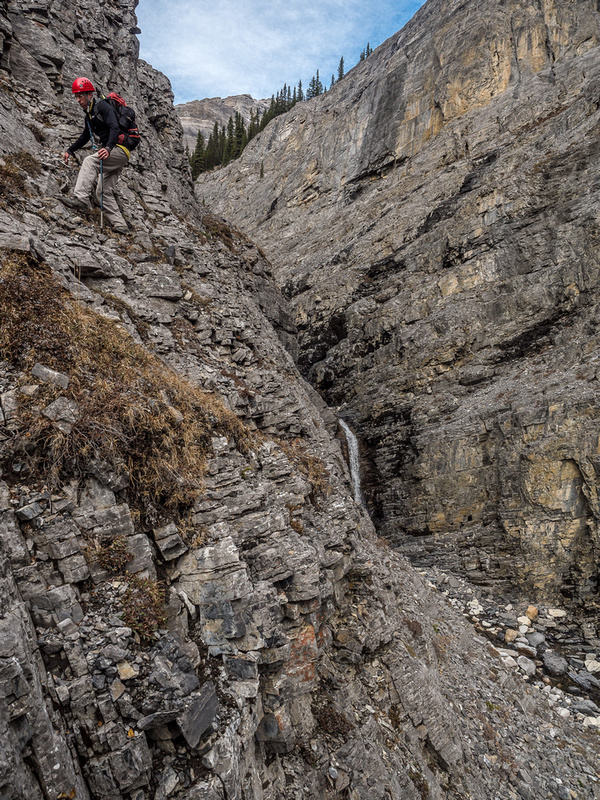 Trevor searches for a way around the crux waterfall. That ain't happening! So we decided to try the steep wall to our left. As I said - it was steep! Certainly difficult you-don't-want-to-fall terrain and very loose but blocky. 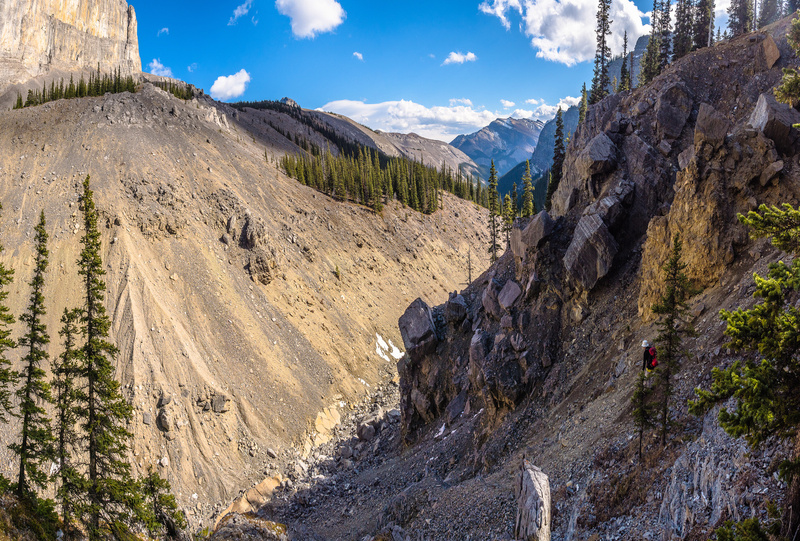 Looking straight down into Claw Creek from the crux wall we ascended. The terrain mellows out a bit as we start paralleling the creek on its west side before descending back down to our right. We side-hilled for a few hundred meters before descending back down to our right. The watercourse is once again easy terrain and lovely landscapes as we trend right towards the southwest aspect of Castle Rock. 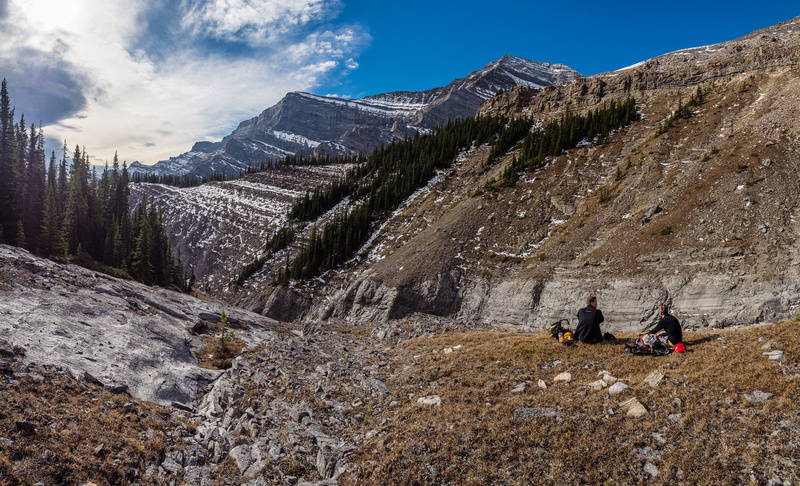 It was hard to leave this lovely lunch spot, just out of the upper canyon. Poltergeist looms above our grassy perch. 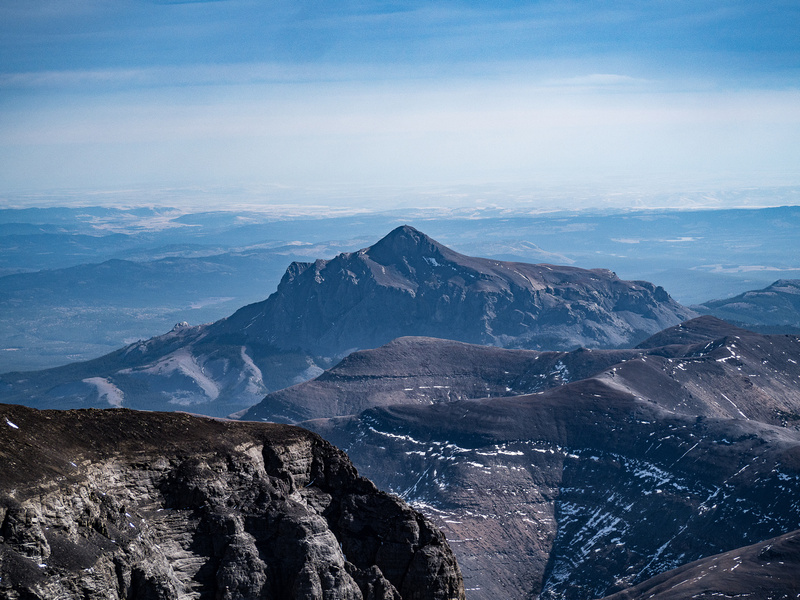 The summit sits around 700 vertical meters above us after over 4 hours on approach. Looking back at Poltergeist Peak. 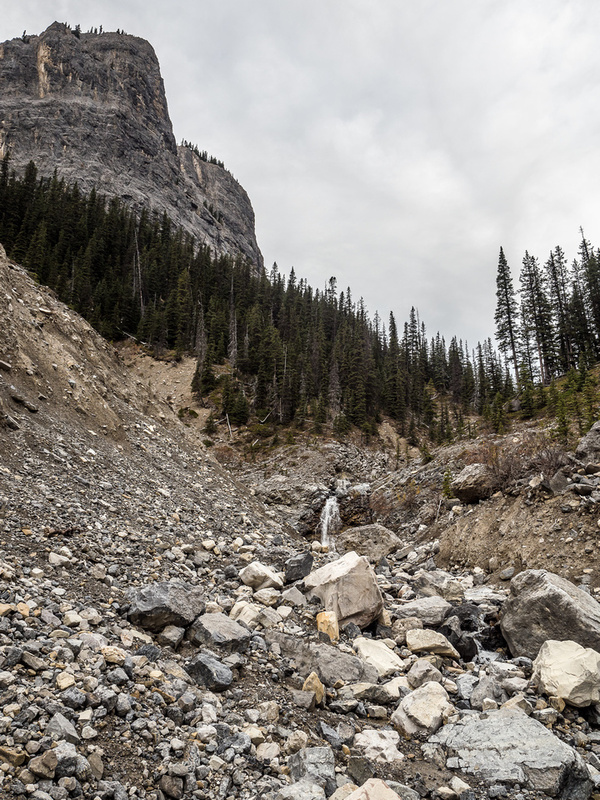 Water is still running down slabs as we ascend! Pretty soon after this shot it finally turned to ice before petering out. 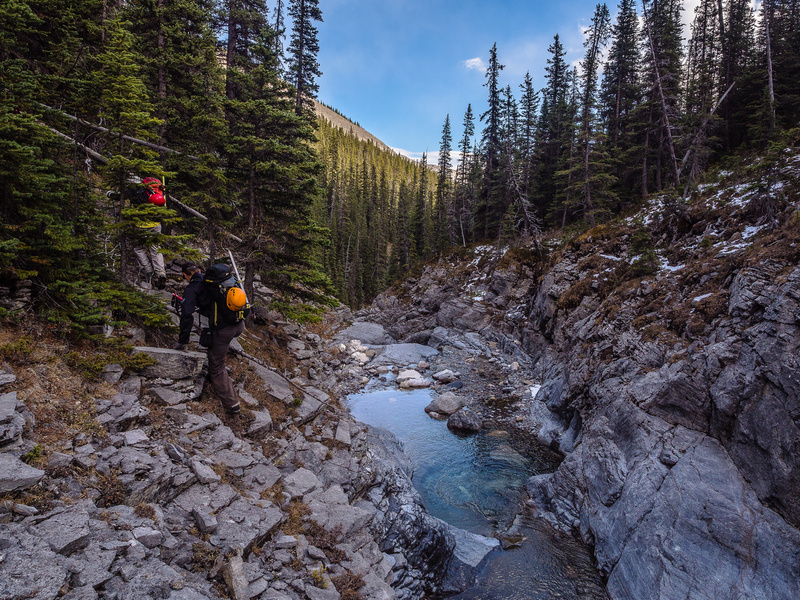 The running water finally decides to turn to ice as we work our way up in a shallow gully. Poltergeist showing off in the background now. Trevor on the endless southwest slope of Castle Rock with the giant Costigan in the distance. Cornelius slowed down so that we could catch up for the summit push. The summit block looks pretty darn tame from this angle. 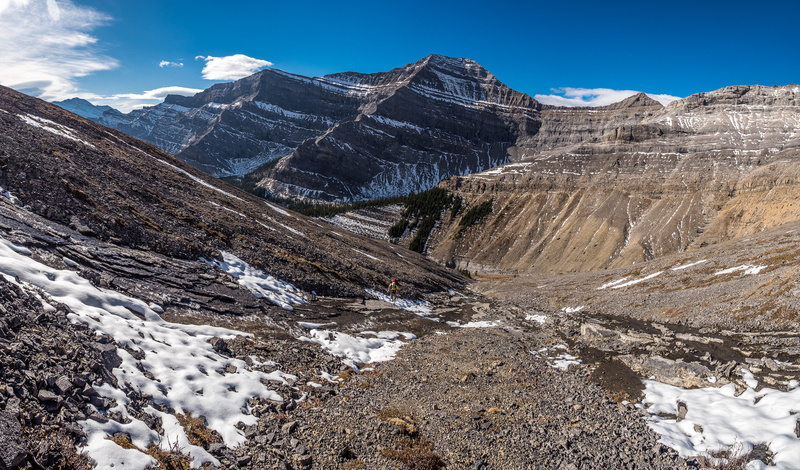 Looking back at the south ridge as we traverse towards the summit block. Devil's Head at left and Poltergeist at right. Looking towards the summit block. 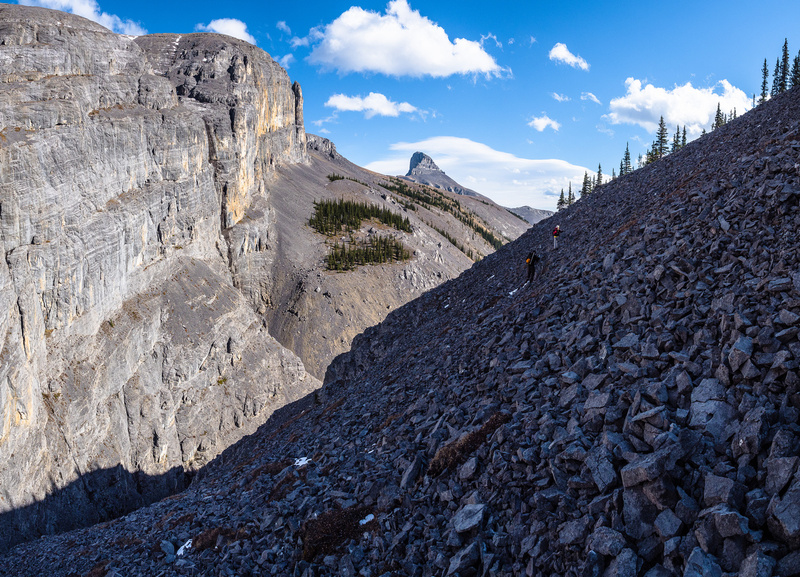 We had fun finding some moderate scrambling up the summit block, but it was avoidable if we simply traversed a bit further under the block to the north. Looking towards Mount Davidson and Waiparous Creek. From L to R, Costigan, Pakakos, Peechee, Girouard, Inglismaldie, Poltergeist, Aylmer, Spectral, Apparition, Revenant and Astral Peak. 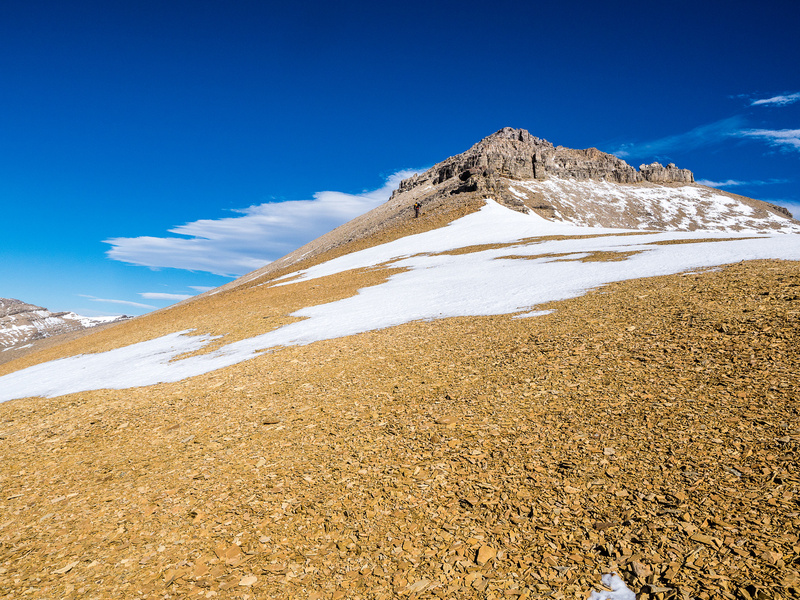 I attempted Mount Davidson earlier this year with Eric Coulthard but we had to settle for an outlier (out of sight at right) that we dubbed, "Waiparous Peak". Poltergeist is very close to the same height as Castle Rock. Aylmer is higher (R). 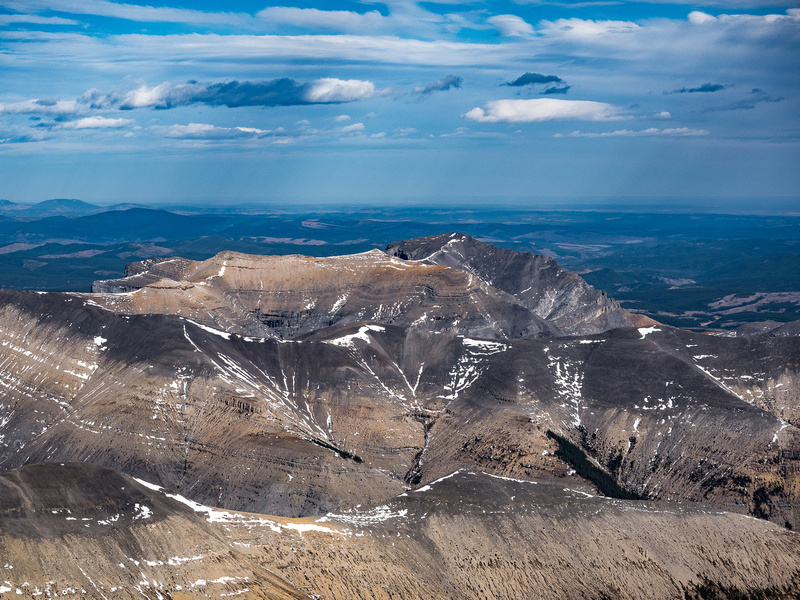 This small front range summit is known as "Kink Peak" on Bivouac and has been called "Ghost" as well. 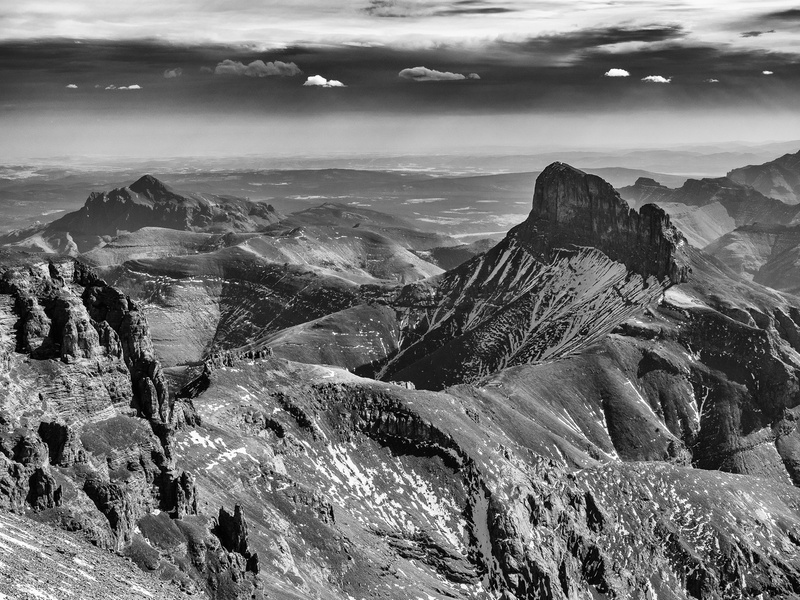 Dramatic views of Black Rock (L), Bastion Ridge and of course, Devil's Head (R). Devil's Fang (Phantom Crag) is just to the right of Devil's Head. 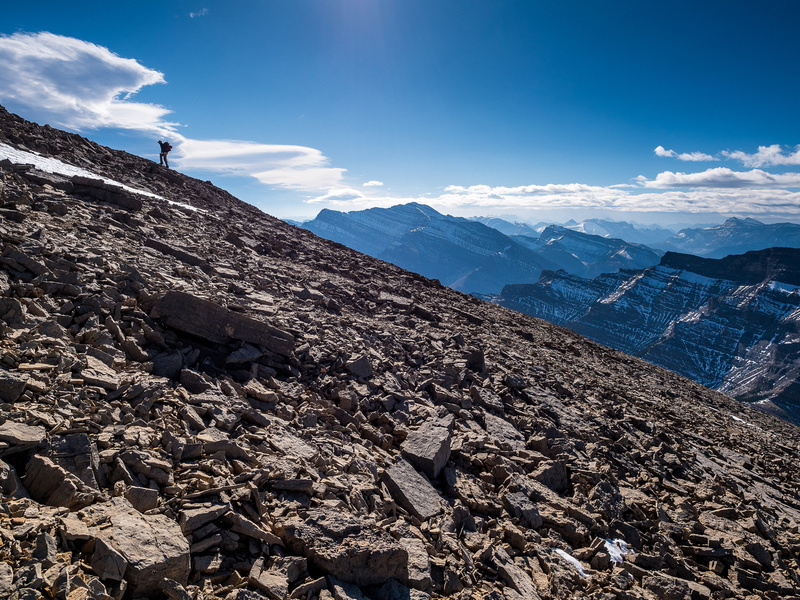 Taking advantage of easy scree on descent. Another break at our favorite lunch spot before the weather finally moves in. 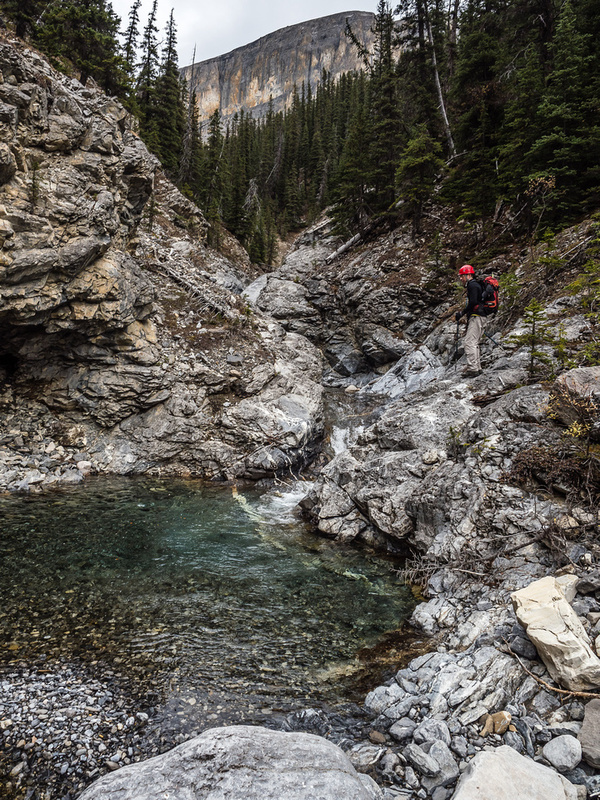 Dropping back into Claw Creek. The slope at distant left is the one that we will use to bypass the canyon waterfall crux. 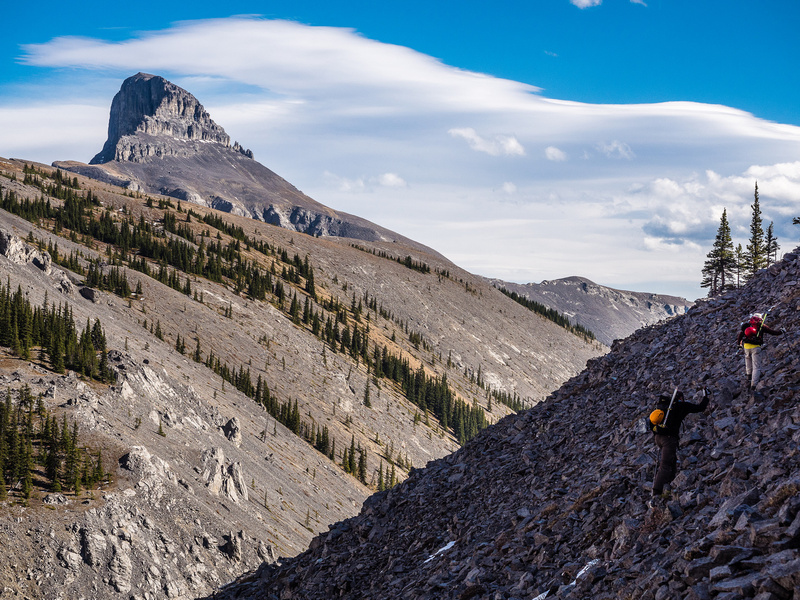 Traversing high on Claw Creek's south bank with Devil's Head watching over our progress. Exiting the upper Ghost Valley on our bikes.